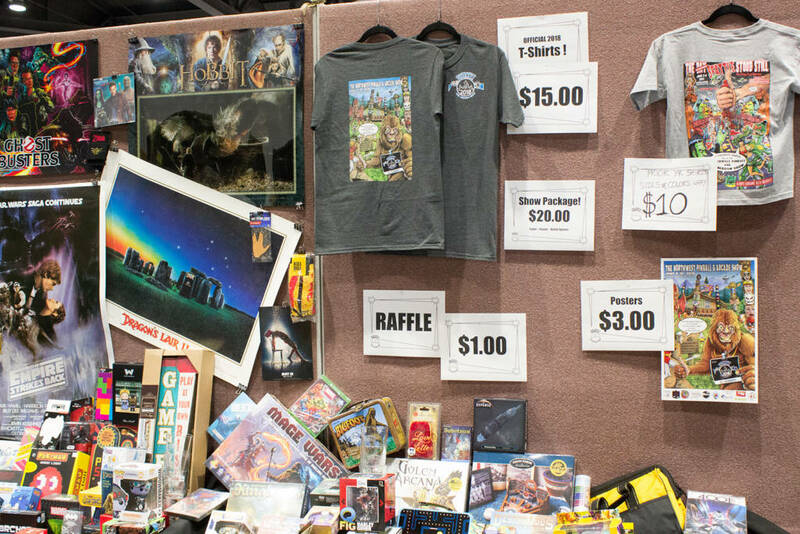 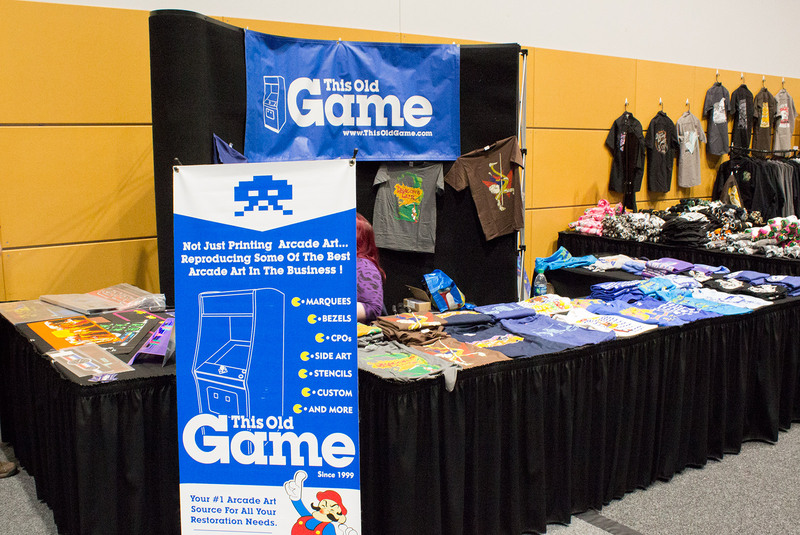 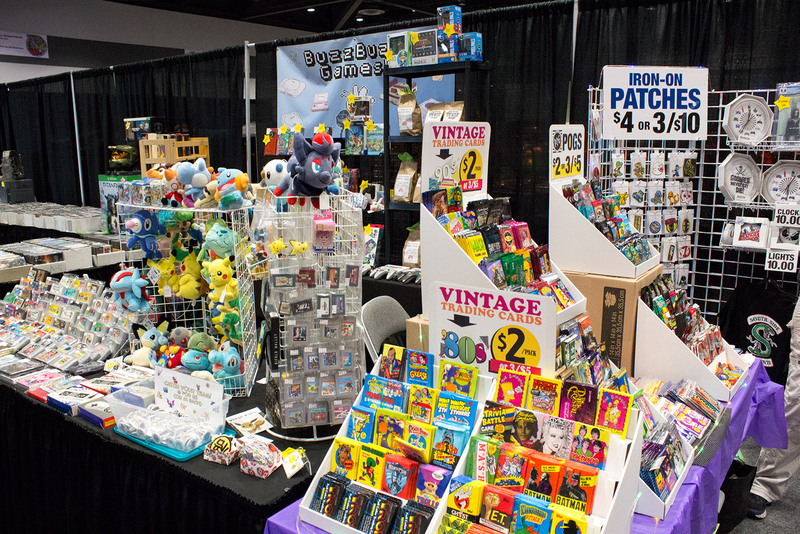 We’re back at the Greater Tacoma Convention & Trade Centre for the opening of the show at midday on Friday. 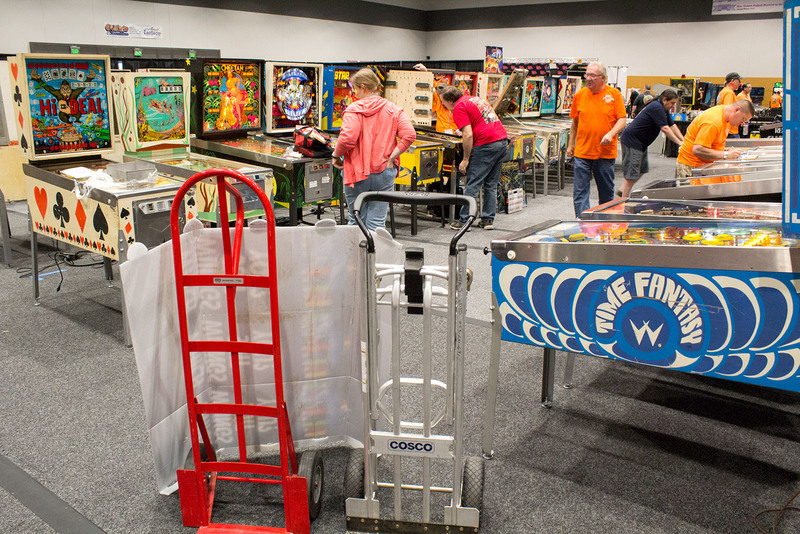 Inside the main hall, work was continuing on setting up all the machines and stands. 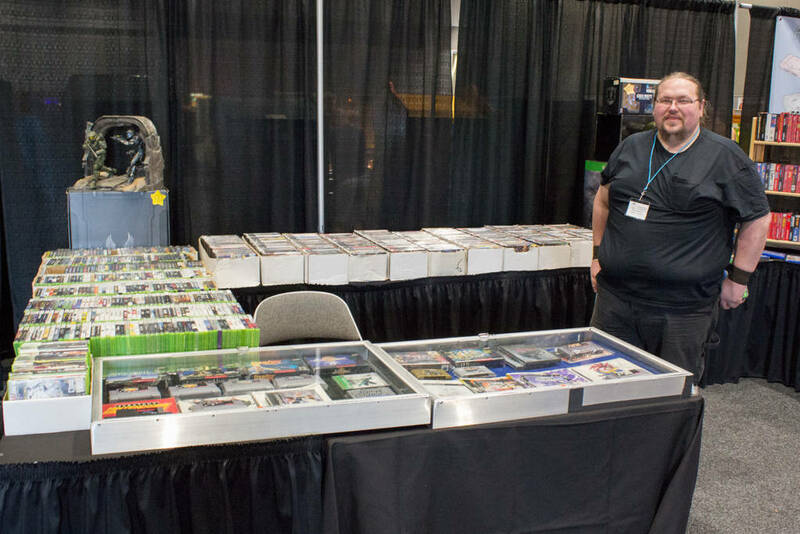 The main show desk The grand prize raffle machines for each day’s draw had arrived, along with the main Houdini prize for the draw on Sunday afternoon. 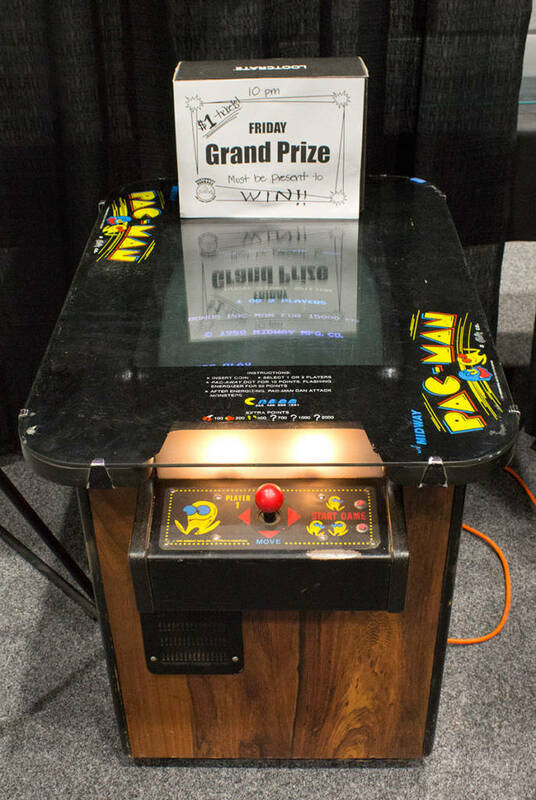 The grand prize Houdini game Friday’s main prize, a Pac-Man cocktail game Saturday’s prize Flash Gordon pinball Sunday’s daily draw prize – an Asteroids upright The show desk also displayed the many smaller raffle prizes as well as selling show souvenirs such as posters and shirts. 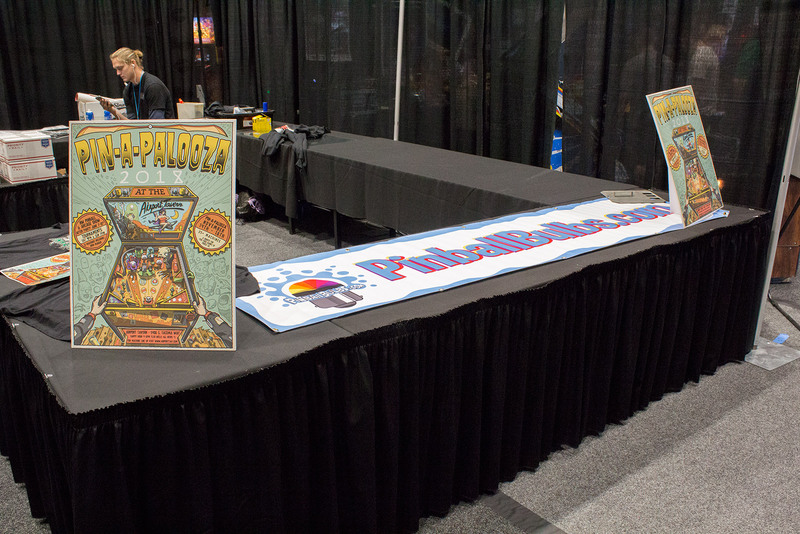 Raffle items and show souvenirs Next door, Next Level Pinball Shop had a nice line-up of machines for guests to play. Next Level Pinball Shop’s display Around the corner was the Nitro Pinball stand where the latest titles could be played. 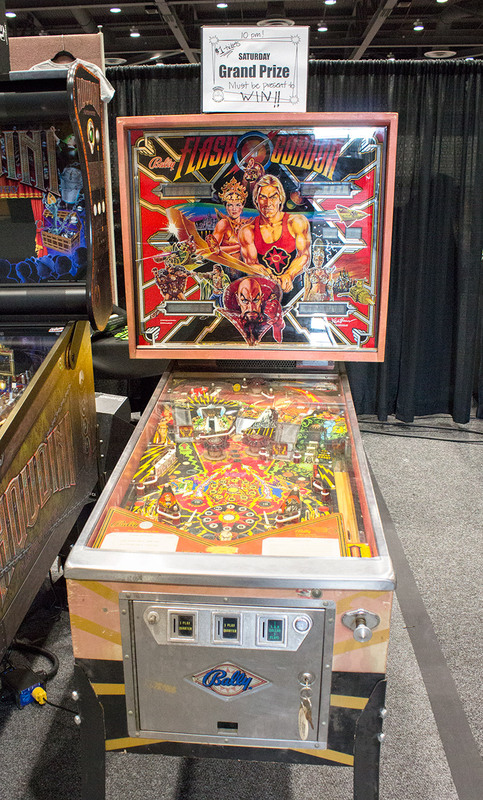 The Nitro Pinball stand The Thunderbirds game was getting a lot of attention even before the show opened We had a sneak-peek inside Thunderbirds to see how it is put together. 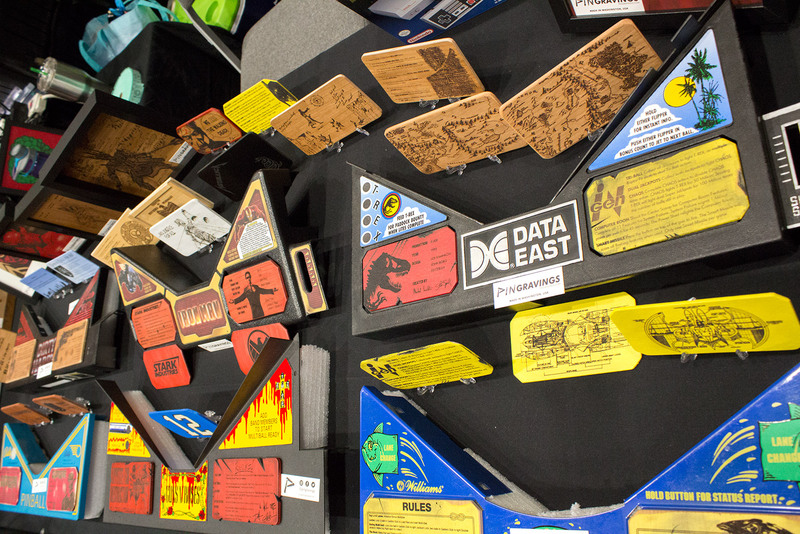 It’s worth noting that this is still only a prototype game so various elements may change before production. 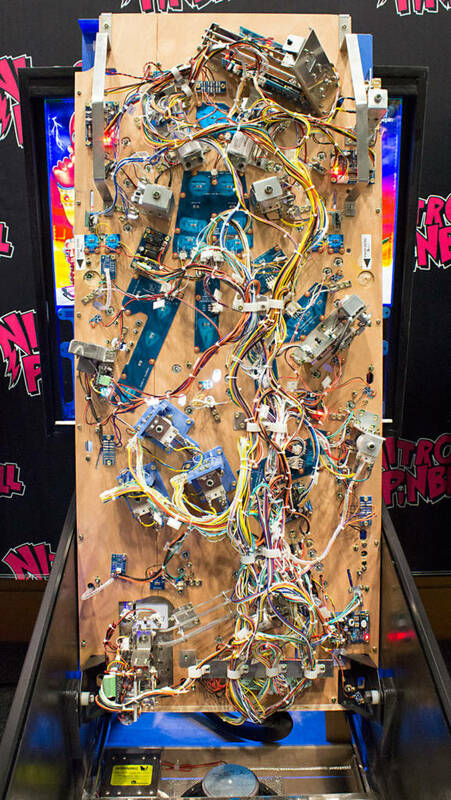 Let’s look inside The display/speaker panel swings out of the way The control and audio boards Power supplies, a shaker motor and a bass speaker in the cabinet There is a substantial playfield support bracket Under the playfield Marco Specialties had an impressive collection of Stern Pinball’s latest titles, including nine Iron Maiden titles most of which were the Premium model. 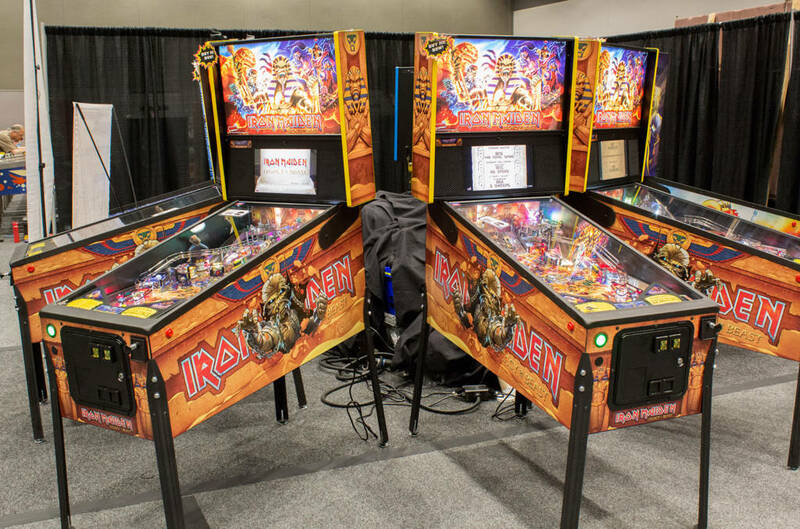 The Marco Specialties stand The Pro (left) and Premium (right) models The Premium cabinet art Some of the Iron Maiden games on the Marco Specialties stand It wasn’t all Iron Maiden though The Aerosmith pinball topper Throughout the hall, games were being readied for the midday opening. 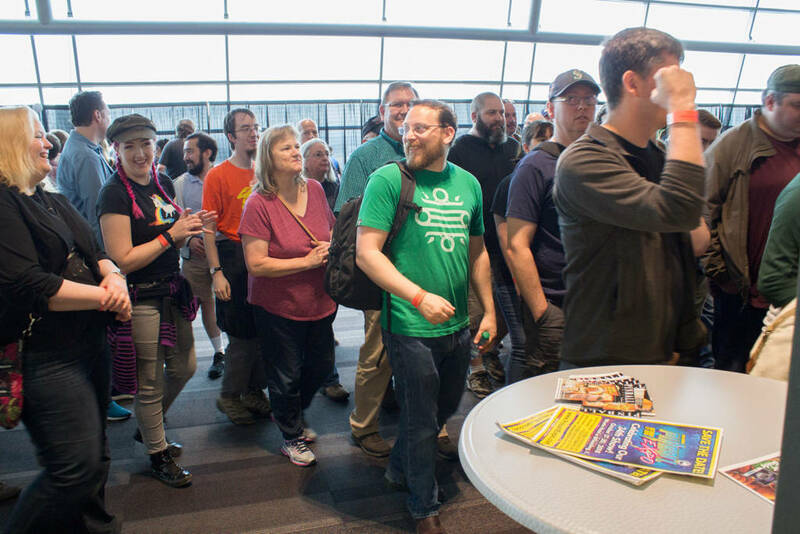 The hall was packed full with hardly any space not being home to a machine of some description. 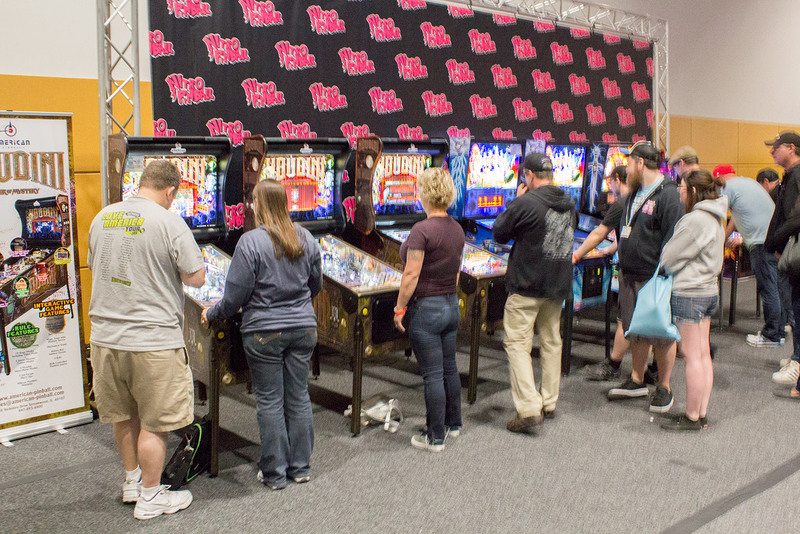 The three huge PinballFX machines dominate the central area Some of the many free play pinballs The final finishing touches are applied More free play pinballs The show always has a good selection of electromechanical pinballs More EM pinballs, plus one early solid-state More games being set up Custom pinballs on the Fast Pinball stand The show is not all pinball though, as there are dozens and dozens of video games from uprights to sit-downs to cocktails. 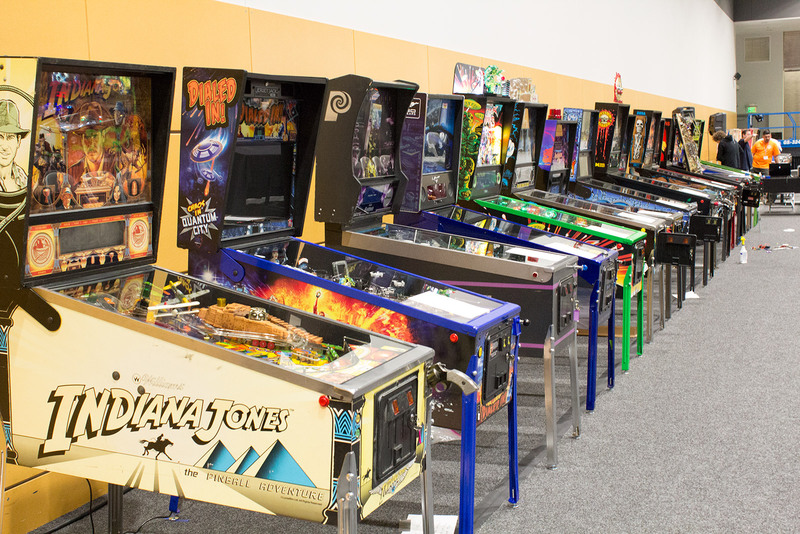 Some of the many upright videos More videos, this time mostly shooters More videos Sit-down racing games In the centre of the hall there’s a repair area where the pinball medics keep the games running. Pinball medics in their central triage area With an eager crowd of competitive players outside waiting to start qualifying, the tournament machines were coming together. 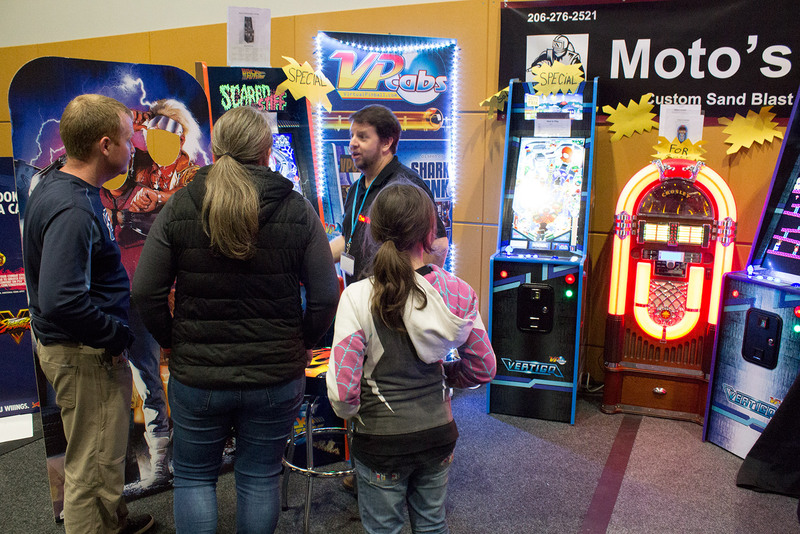 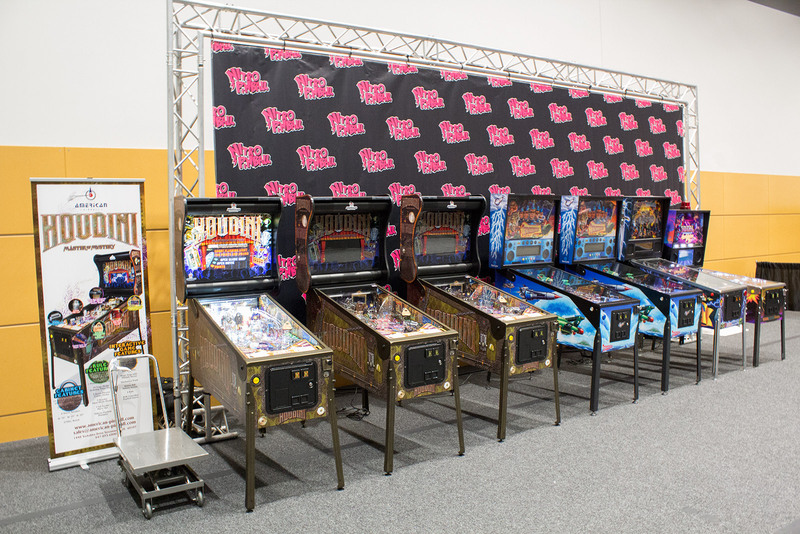 Some of the tournament pinballs Outside in the lobby, guests were queuing to collect their pre-purchased entries. 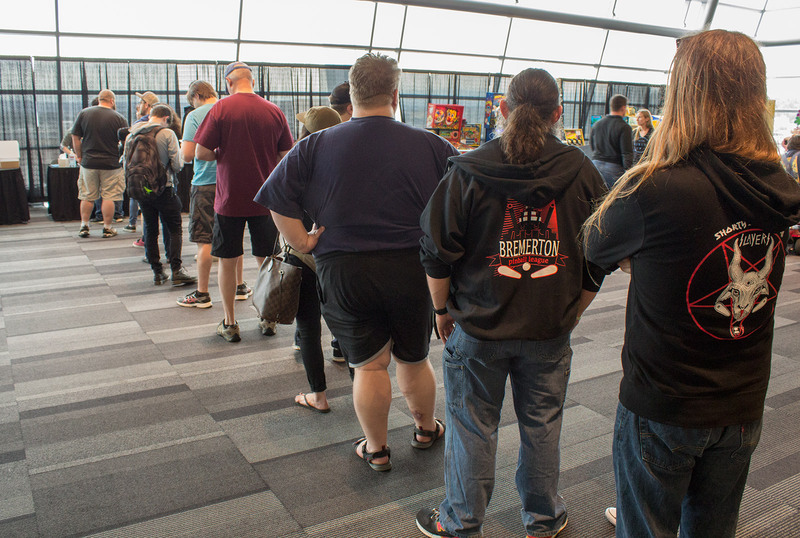 The queue to collect the pre-paid registration packages Another registration is collected Then at midday the doors were opened and the first guests could enter the show hall. 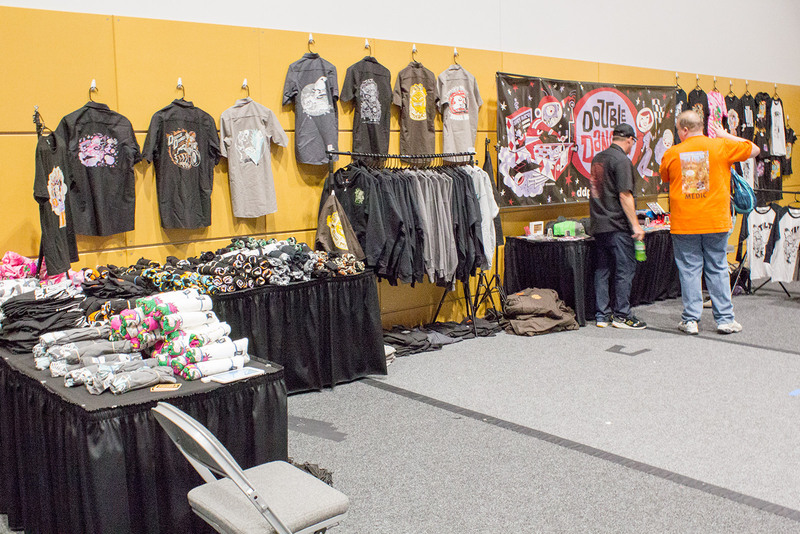 It’s noon, time to open the doors The first guests enter the show hall Let’s now take a look at the vendor stands in and around the show hall. 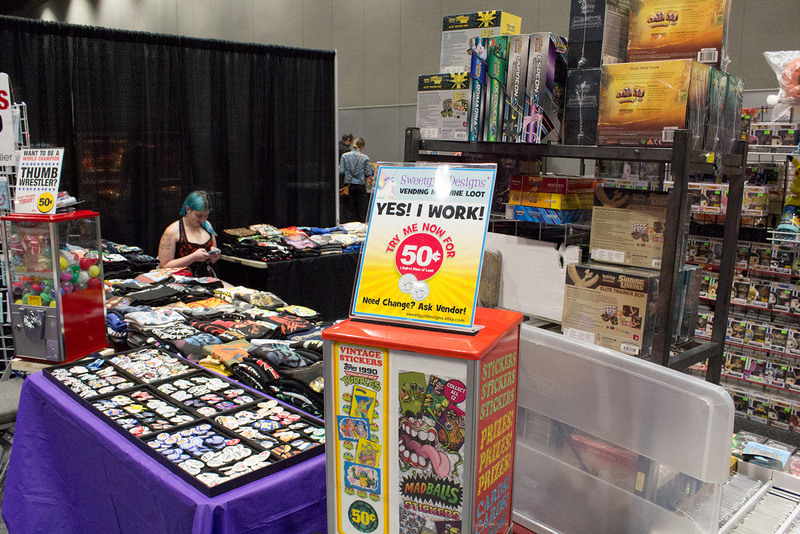 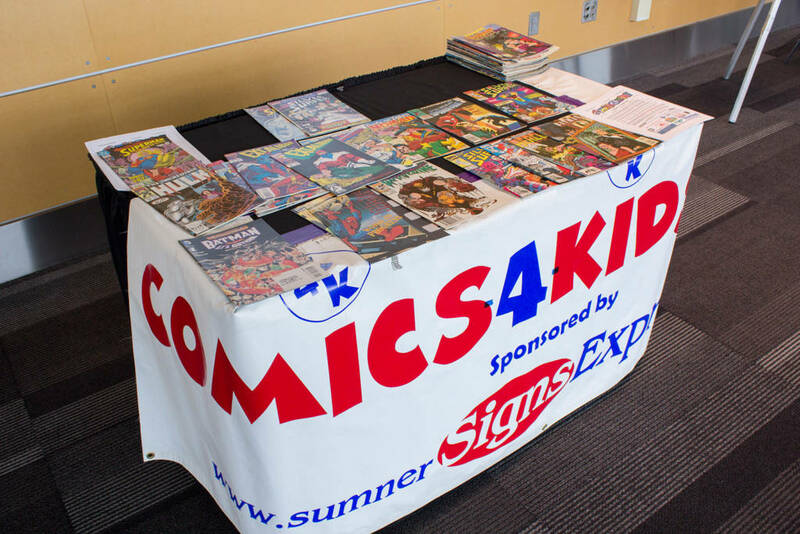 Comics4Kids had an unmanned table set up just outside the hall giving away comic books Next to Comics4Kids was a noticeboard where visitors could post advertisements for pinball or arcade items they either wanted or had for sale. 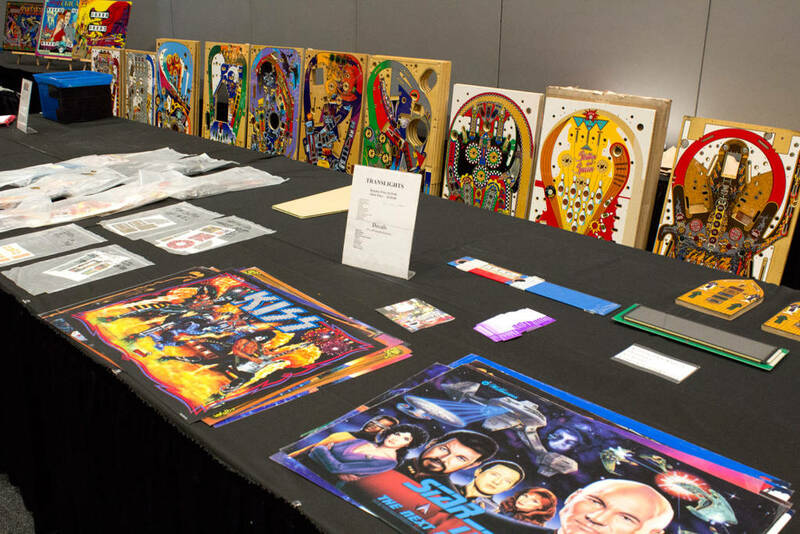 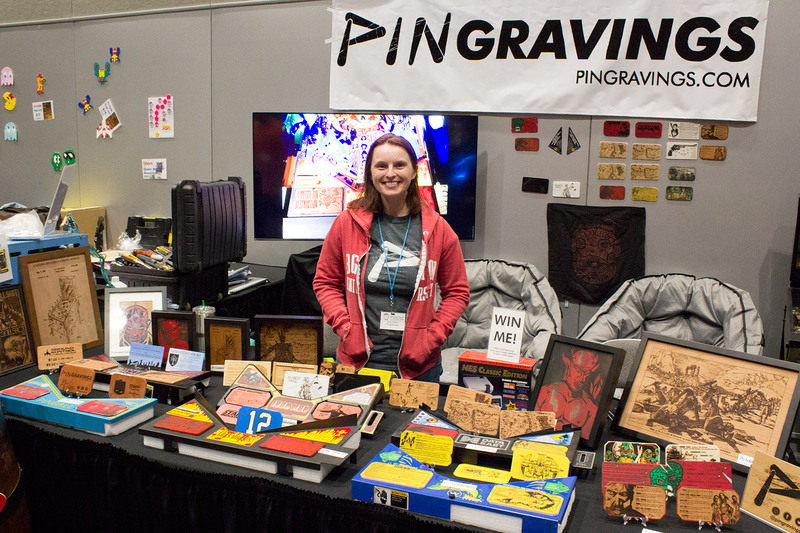 The NWPAS guest noticeboard Inside the hall, on the left was the stand for This Old Game who print pinball and arcade game artwork onto various products and materials. 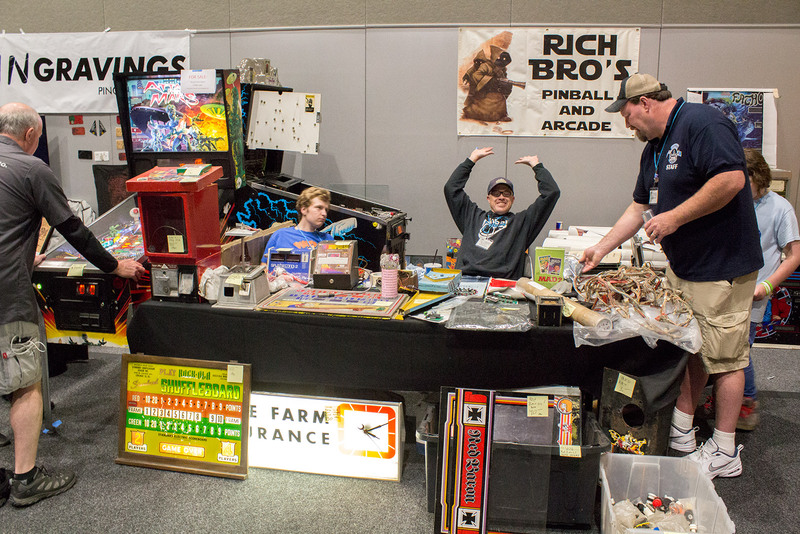 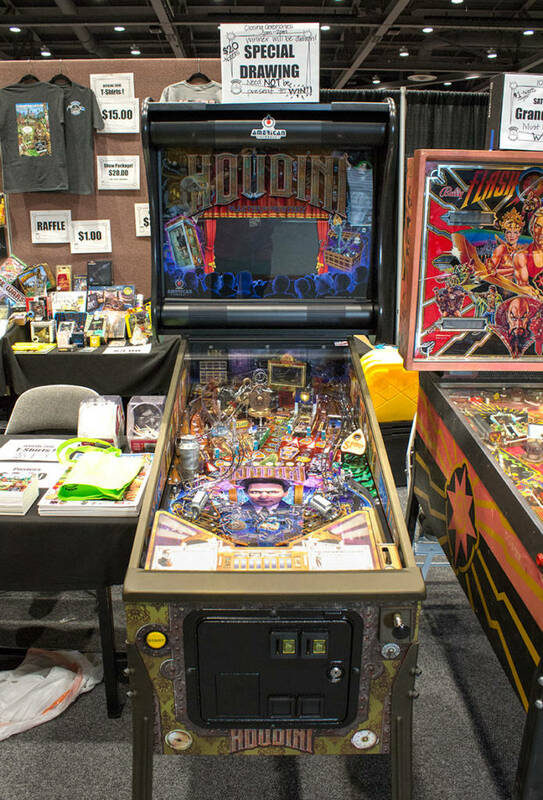 The This Old Game stand Pinball Bulbs have a stand at the show but were not bring any of their products until Saturday. 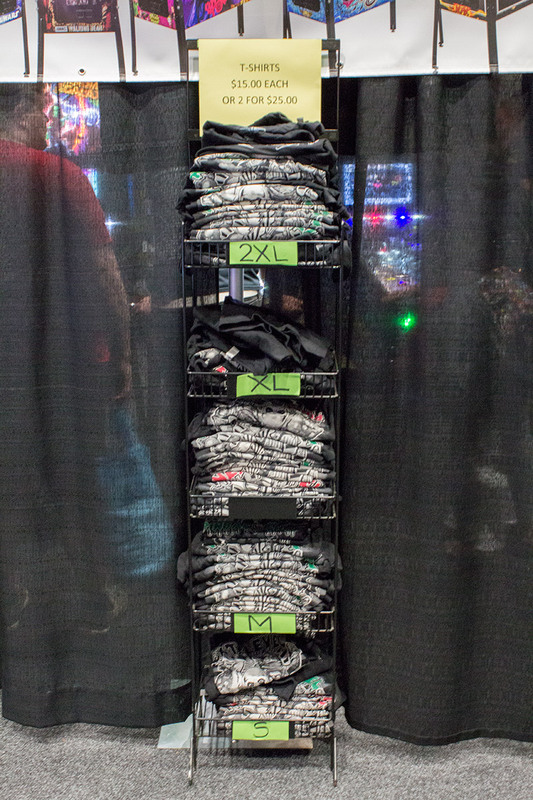 The sparse PinballBulbs stand Next Level Pinball Shop had some promotional T-shirts for sale Their modded machines were now powered up and ready to play Double Danger had their wide range of pinball apparel Nitro Pinball had games from Homepin, American Pinball, Spooky Pinball and Chicago Gaming Stern Pinball’s products were showcased by Marco Specialties Holodeck VR had a nice virtual reality set-up Fast Pinball had three custom games available to play This Proto1 game uses a Pinball 2000 style cabinet and playfield projection system Fast Pinball were also showing their pinball control system and driver boards Starship Fantasy were selling their extensive selection of reproduction pinball ramps and plastics They also had repro playfields, backglasses and translites Rob Anthony’s Pinball Classics stand is always one of the first to set up He was selling a nice selection of regular parts as well as a few specialist products Pingraving had some attractive wooden pinball score and pricing cards Pingraving’s wooden instruction and pricing cards Rich Bro’s always have an interesting selection of new and used parts VPcabs had a small display of their virtual pinball cabinets Moto’s Glass has a range of sand-blasted arcade-themed glasses Sweetgyrl Designs were selling branded shirts, button badges and character models Lots of branded character models BuzzBuzz Games also had numerous branded gaming items Hills of Comics had stacks of video games for various platforms Back out in the lobby, the Kids Zone was being noisily enjoyed by the younger visitors and their parents. 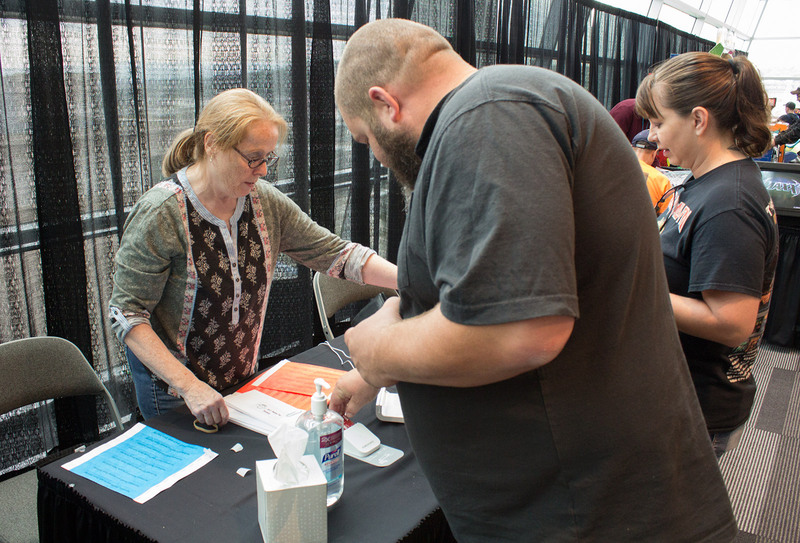 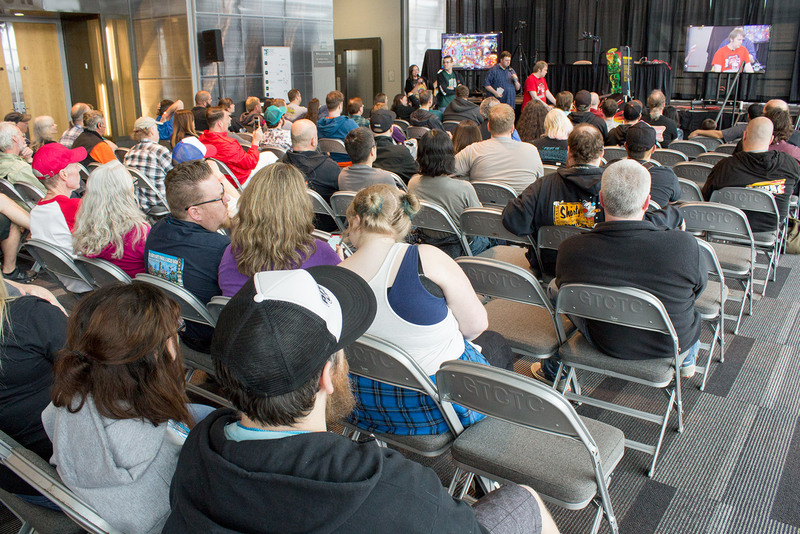 The Kids Zone Friday also saw the start of the show’s seminar schedule, beginning at 2pm. 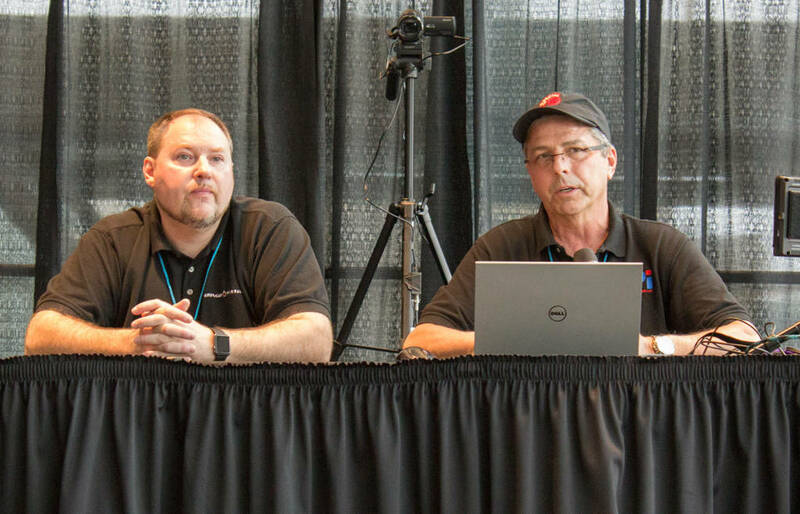 All the seminars were streamed live by GeekGamer.tv and can be viewed live by clicking here. 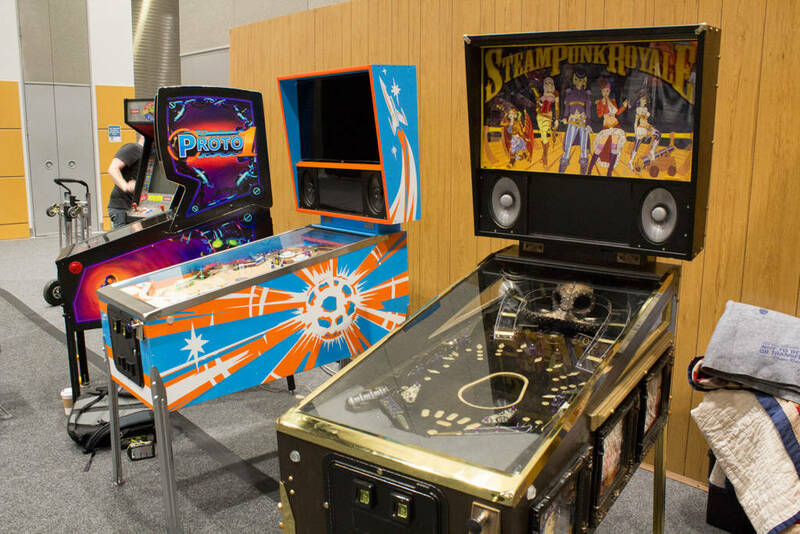 The seminars are held in a dedicated area in the lobby, and the first speakers to take to the stage were David Thiel and Butch Peel who were talking about the making of the Jersey Jack Pinball game Pirates of the Caribbean. 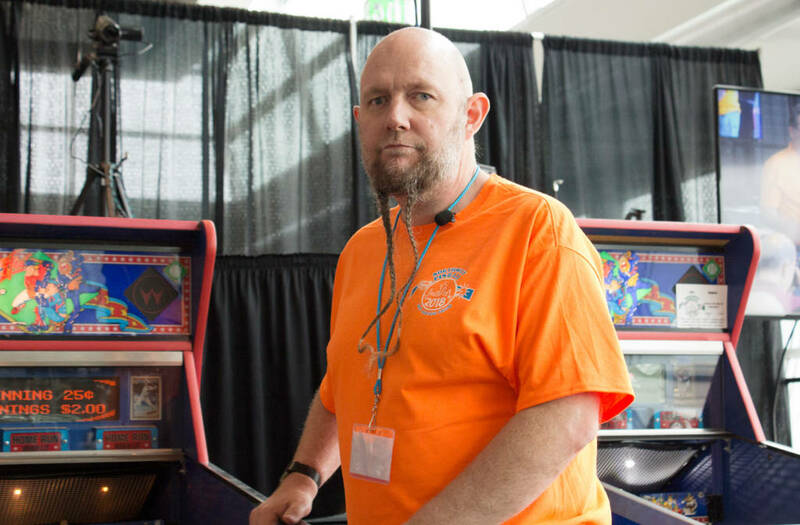 David Thiel David is the freelance composer and sound designer for the game, and he began by explaining how he became involved in the Pirates of the Caribbean project. 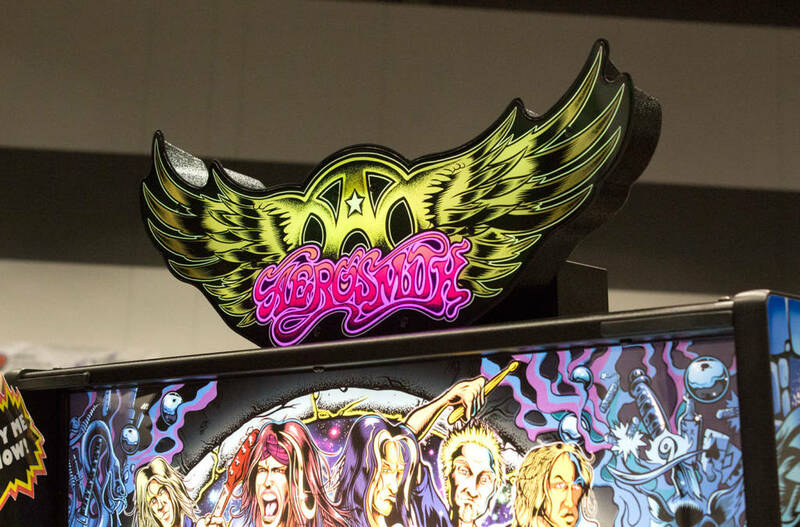 He said he initially turned down the job, having created the music for the Stern Pirates game and knowing how restrictive the licence would be in terms of the minimal assets available and the process of getting Disney to approve everything. 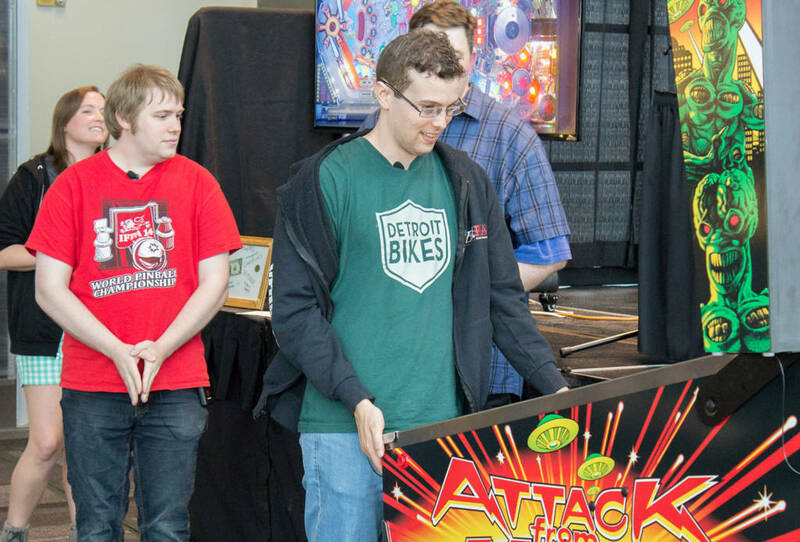 He introduced the team working on the main aspects of the game design before explaining the basic rules and how the multiple music tracks he composed fit with them. 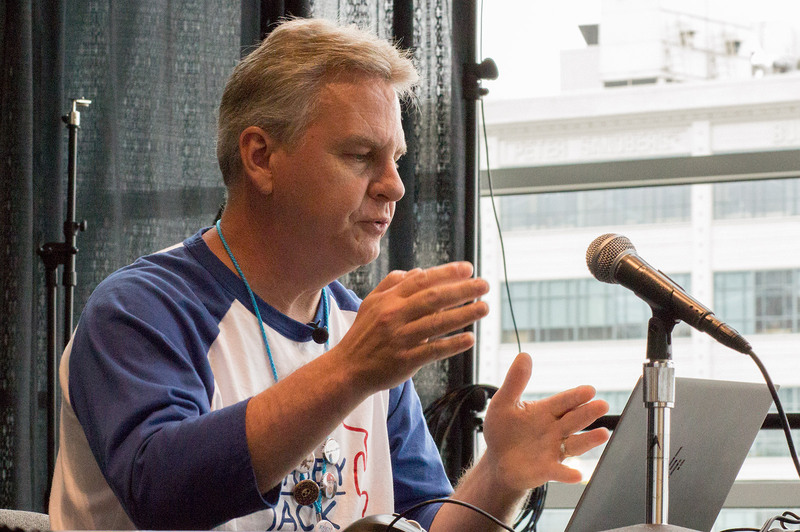 David then looked at one of his wizard mode tracks and broke it down instrument by instrument, showing what each added to the overall mix. 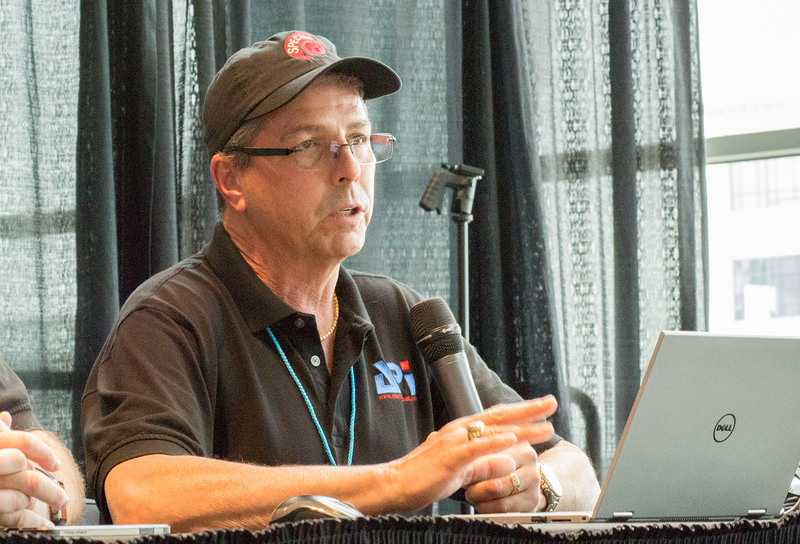 Butch Peel then took over to talk about the development of the Pirates game starting with the game designer’s initial layout. 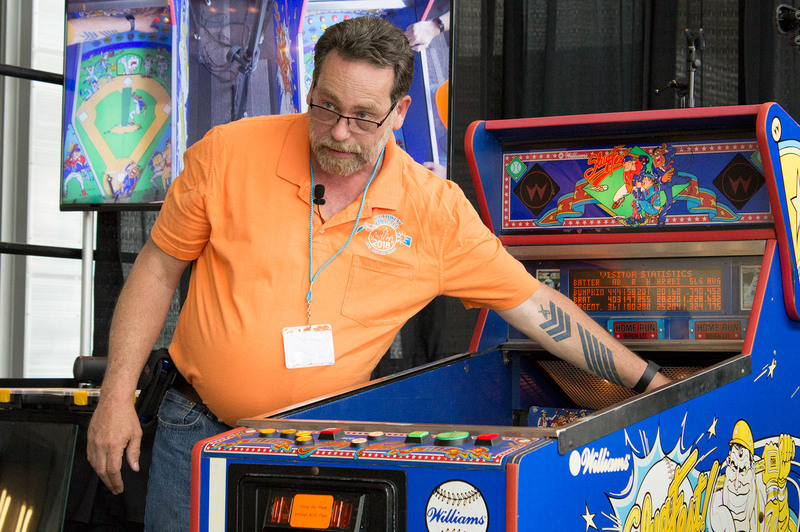 Butch Peel He showed how the first playfield was drawn and cut, how the prototype ramps and wireforms are created, how the ball guides (or flatrails) help fine-tune the shots, and then showed all the sculptures used in the game. 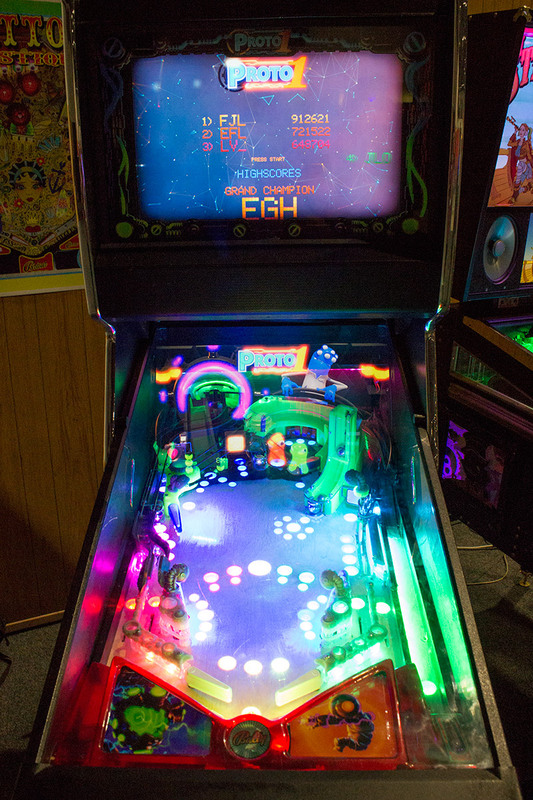 Butch showed pictures of all the stages of playfield development, as more inserts and playfield mechanisms are added. 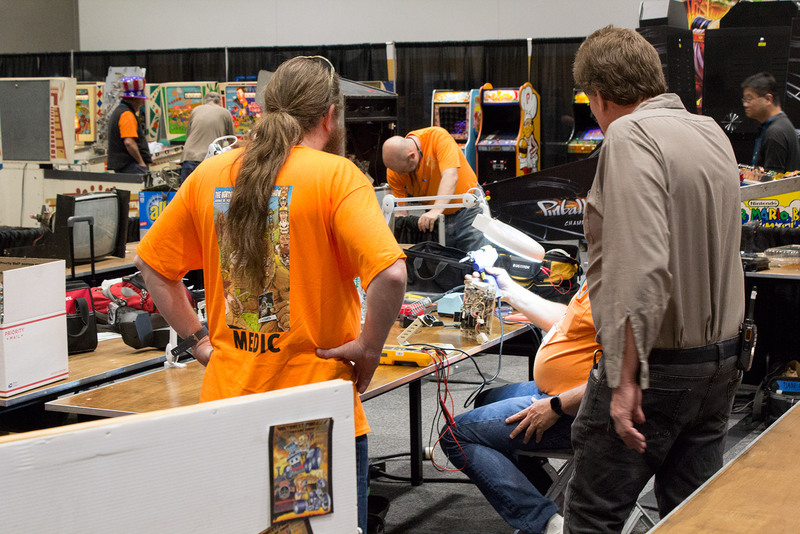 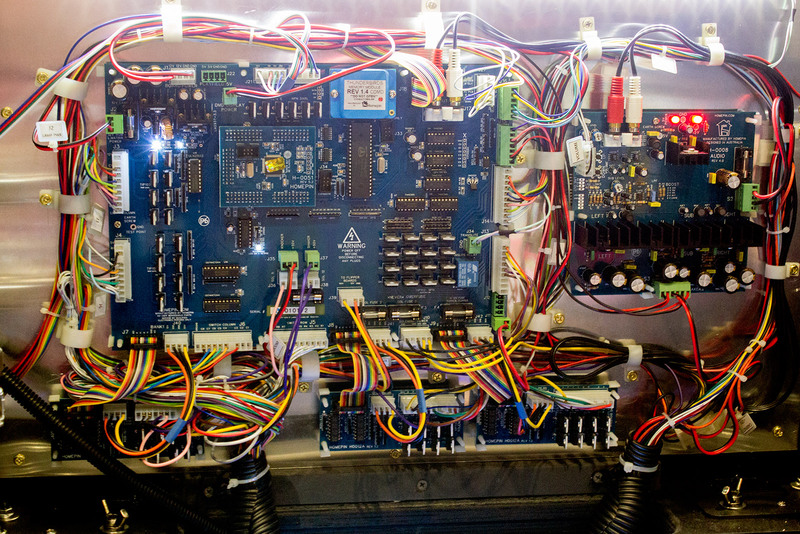 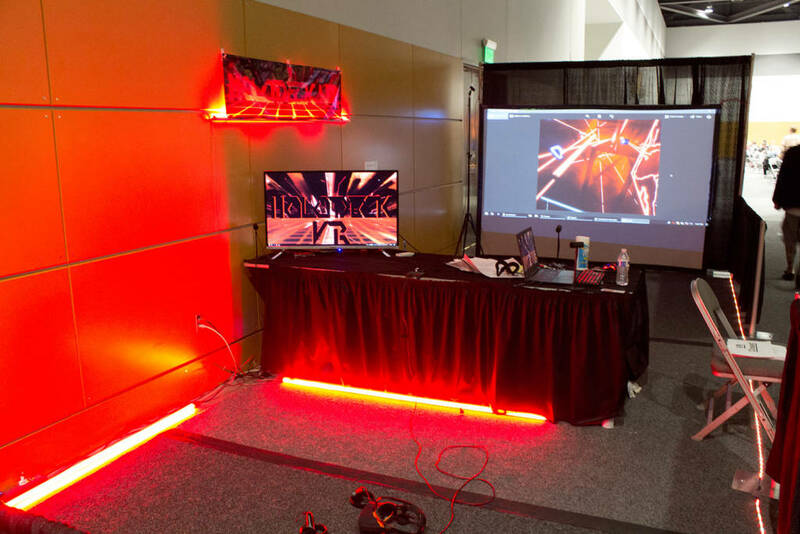 At 3:30pm David Shoemaker and Dave Okert held their seminar about using LEDs to replace incandescent lamps in games. David Shoemaker Dave Okert To illustrate the differences between LEDs and lamps, the brought along two Williams Slugfest games. 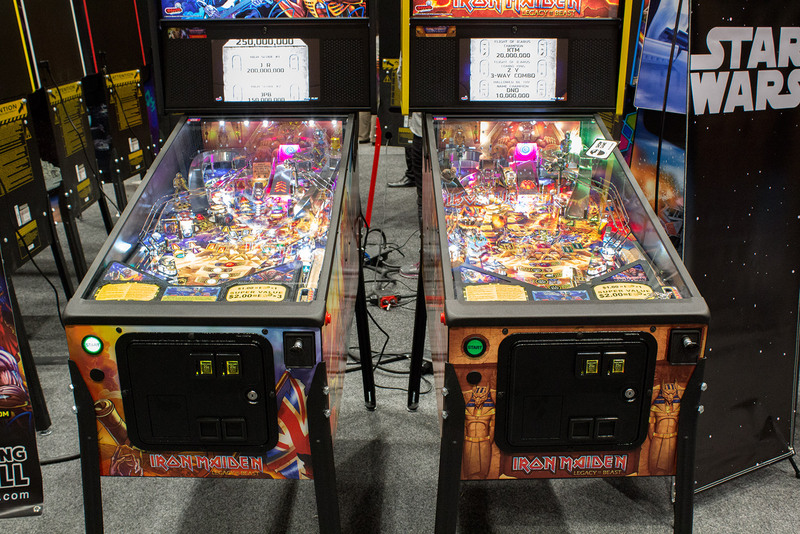 The one on the left used lamps and the one on the right LEDs. 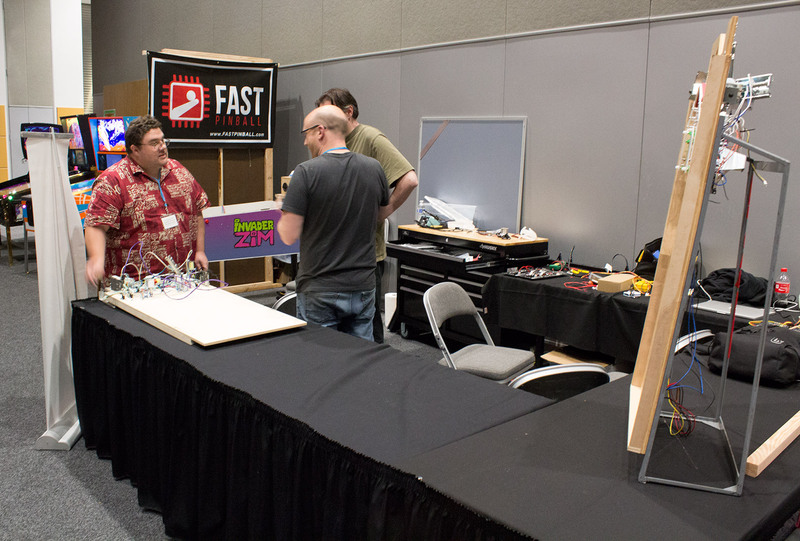 David and Dave with the two Slugfest games The duo explained the benefits of using LEDs, such as longer life, lower power consumption, less heat generated and the more intense colours which can be produced. 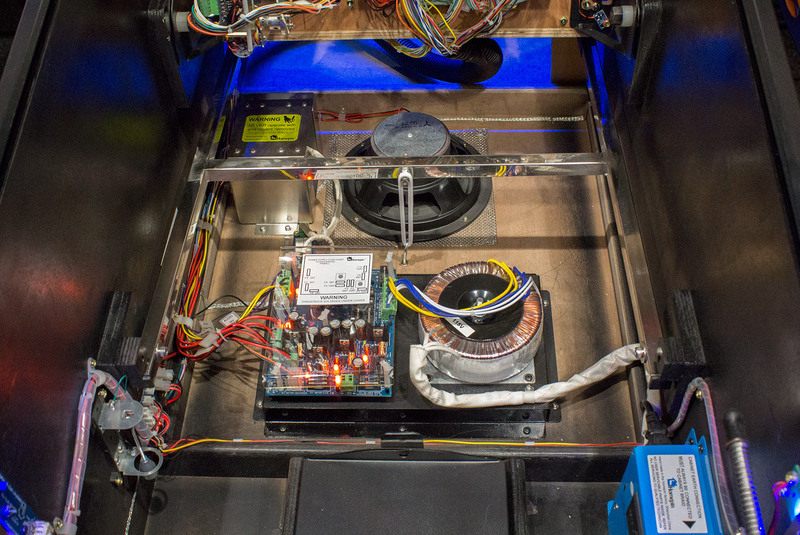 They showed examples of LED replacement devices for general illumination, for use in inserts, for use as flashers, and for use in start buttons and on the coin door. 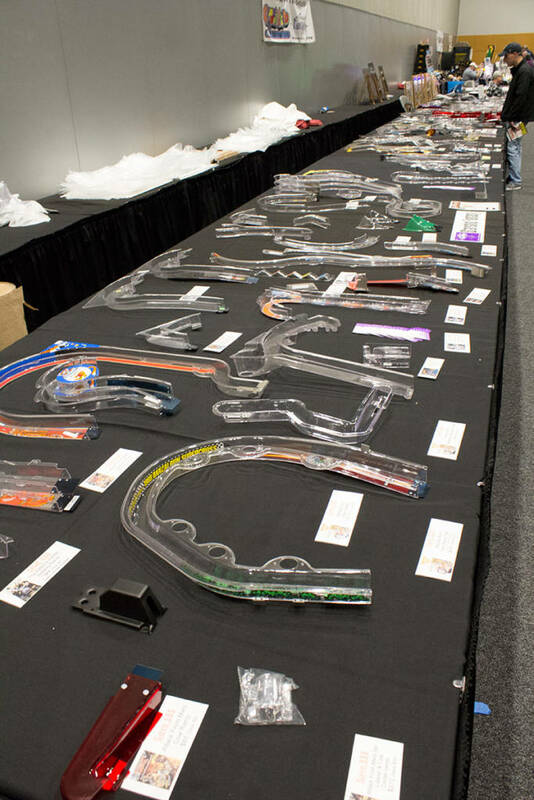 They revealed which companies they prefer and those they dislike, and advised against the purchase of pre-made kits which are often one person’s preference for which colours should go where. 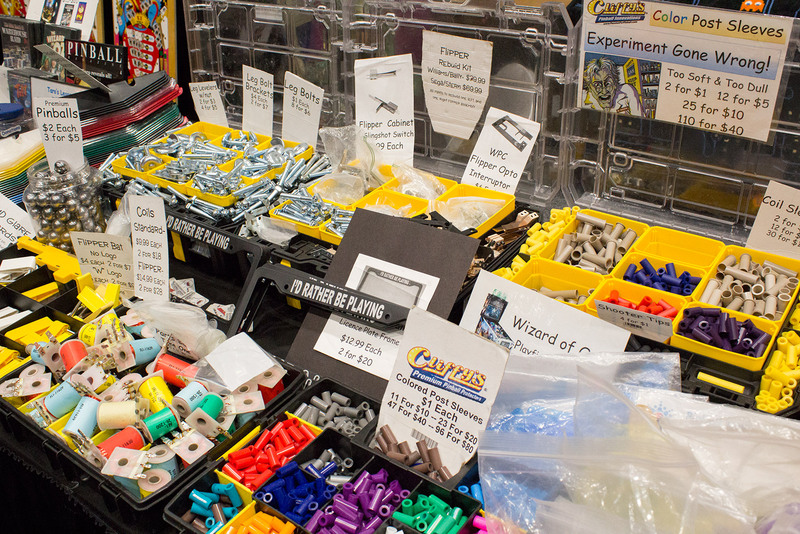 They suggested always making your own kit instead. At 5pm, Joe Balcer and Jim Thornton of American Pinball gave the audience their update on the magic of Houdini. 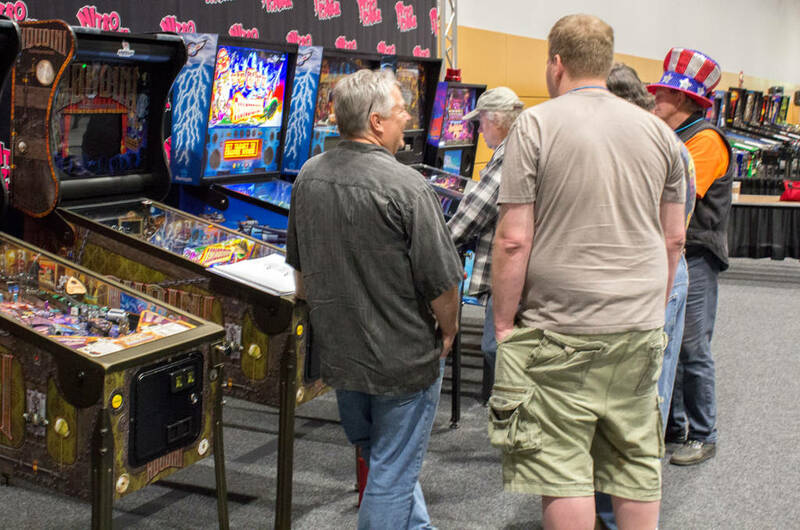 Jim Thornton and Joe Balcer of American Pinball Joe did most of the talking in this seminar and he began by talking about the changes and enhancements made to American Pinball’s Houdini game since it was first shown, including the artwork, lighting, sounds and ruleset. 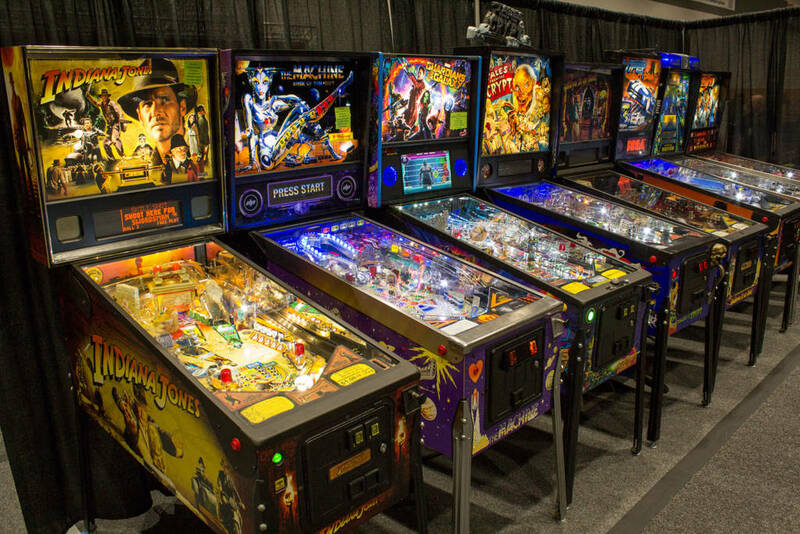 He described how the rules work, how to complete the secret missions, how the movie modes work and the colour-coding used to identify the features available on the corresponding shots. 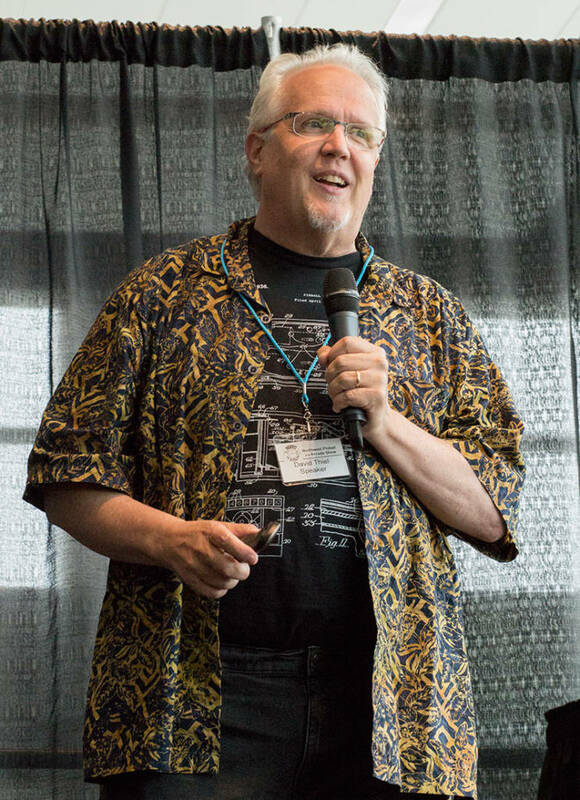 Joe Balcer Joe then showed a video featuring pictures from the factory and the development of Houdini. He said they are currently producing 35 games a week but are running out of room at the factory. To ease that log jam they have secured a new factory which is three times the size of the current one and plan to move into by the end of 2018 of not sooner. 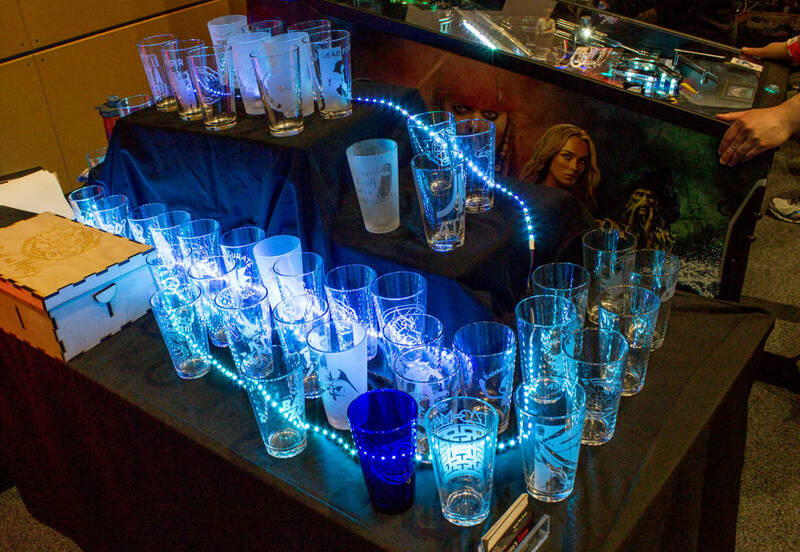 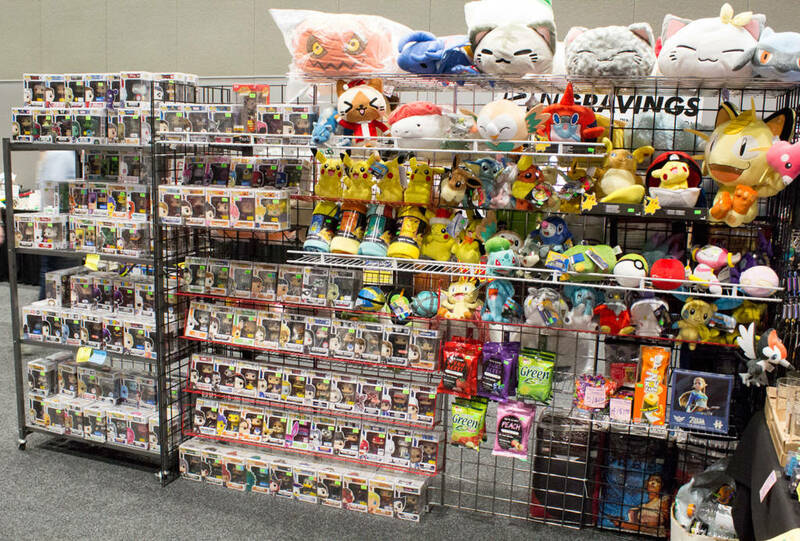 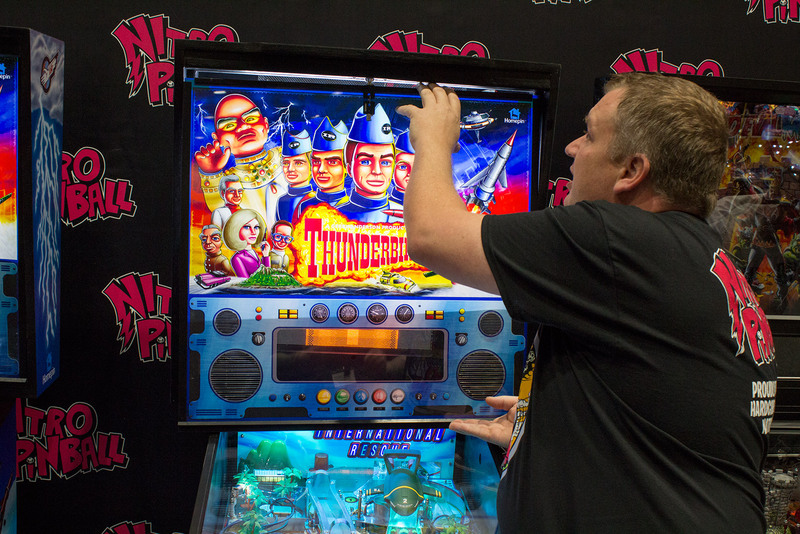 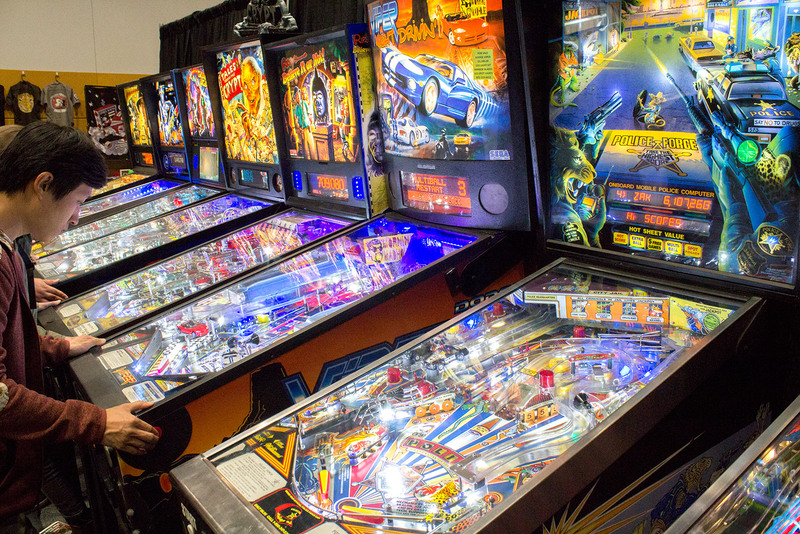 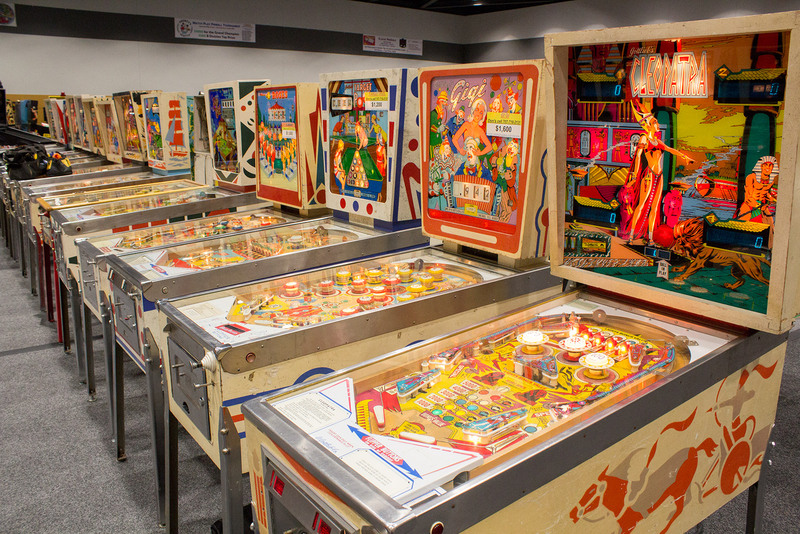 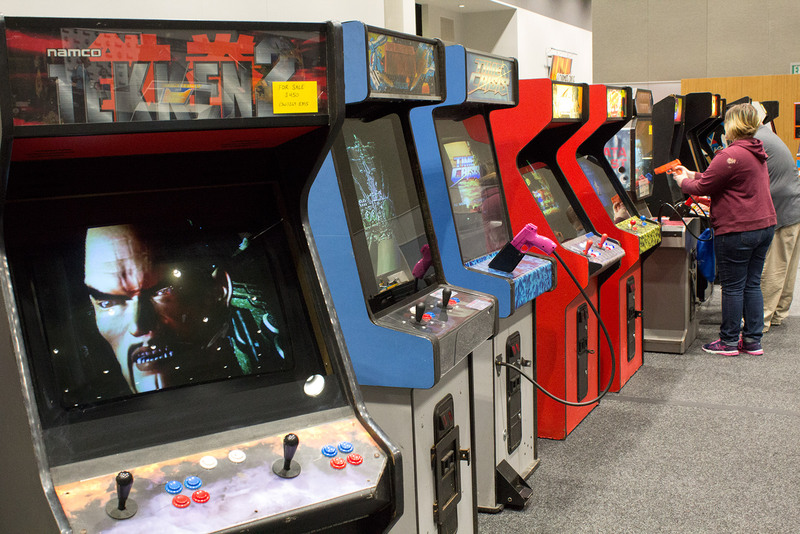 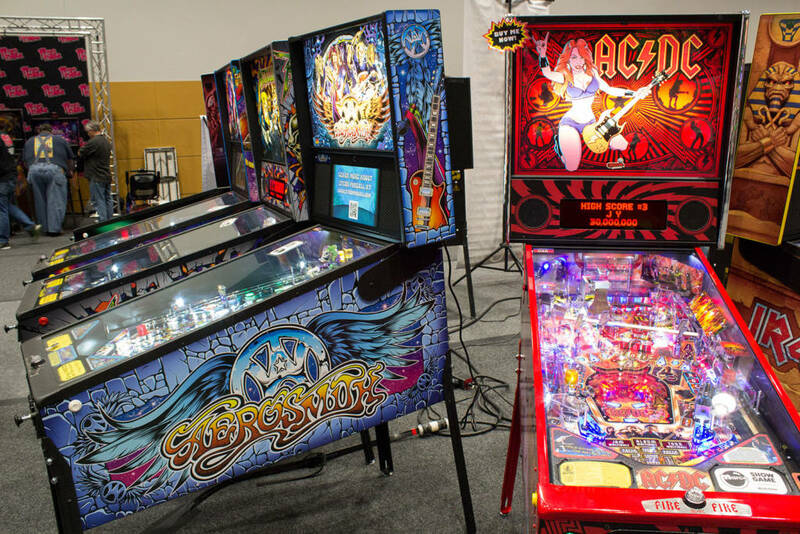 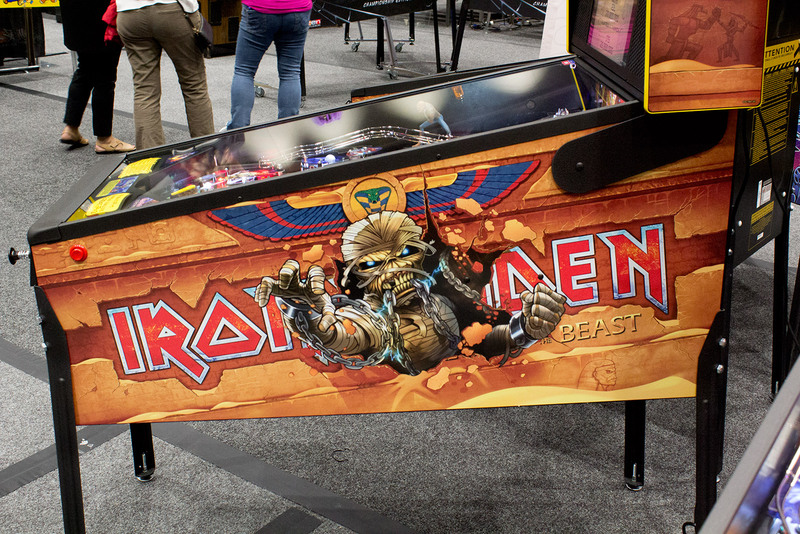 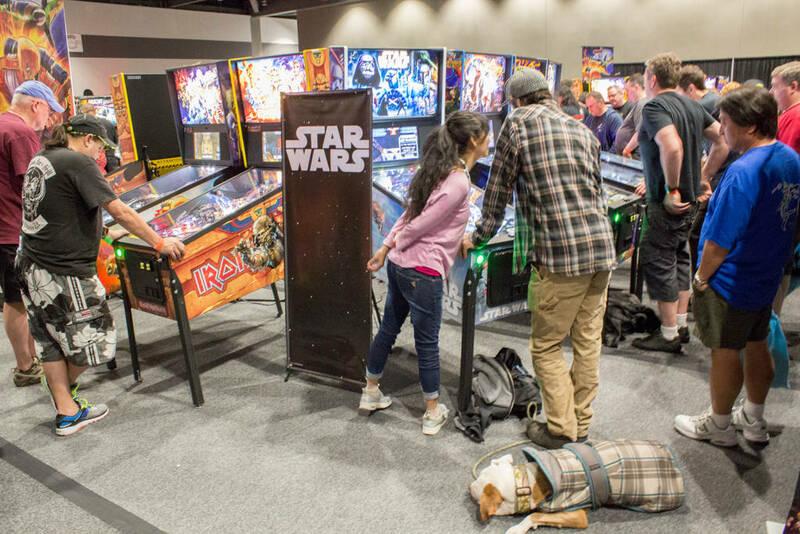 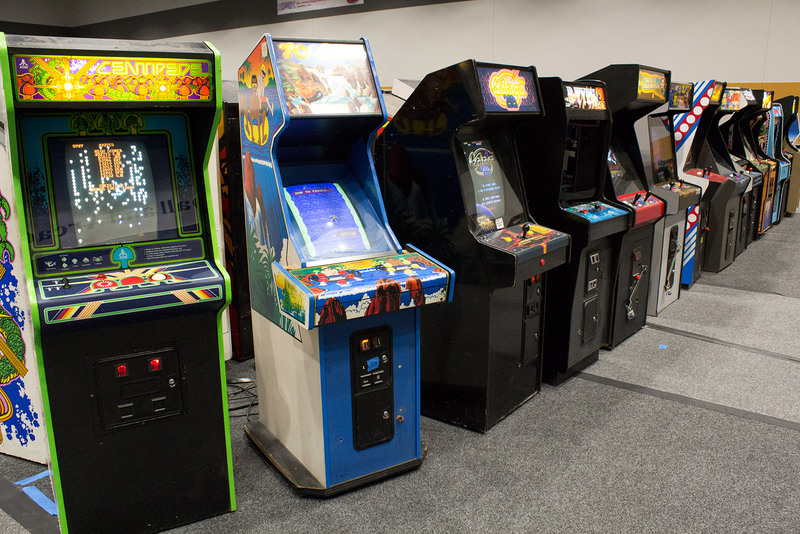 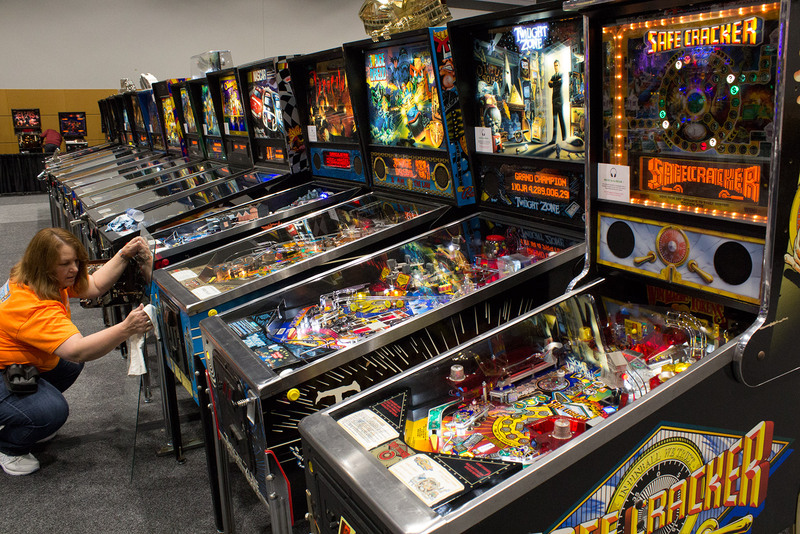 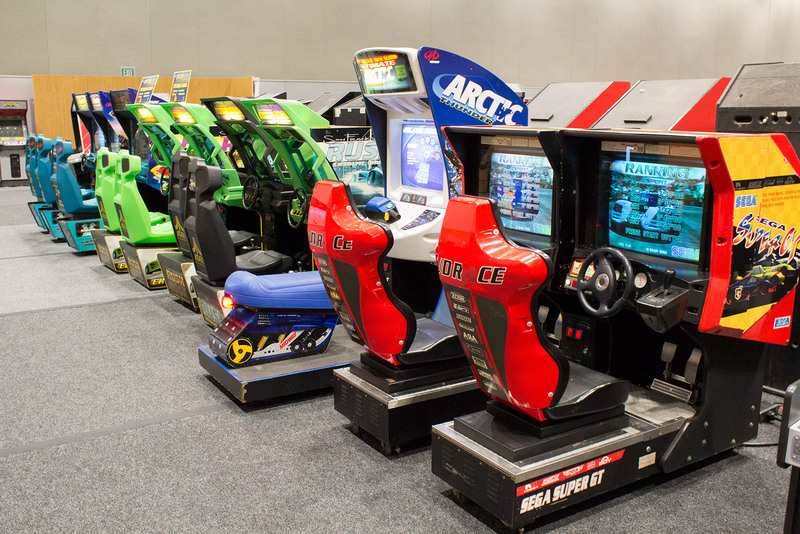 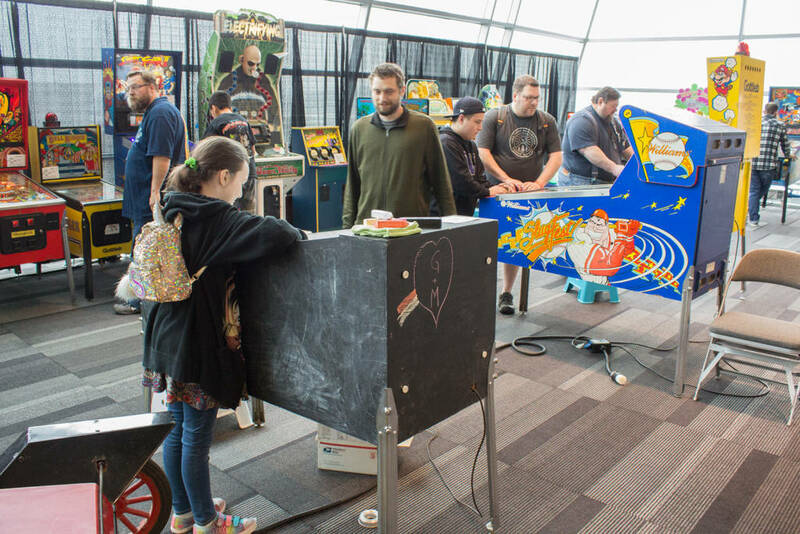 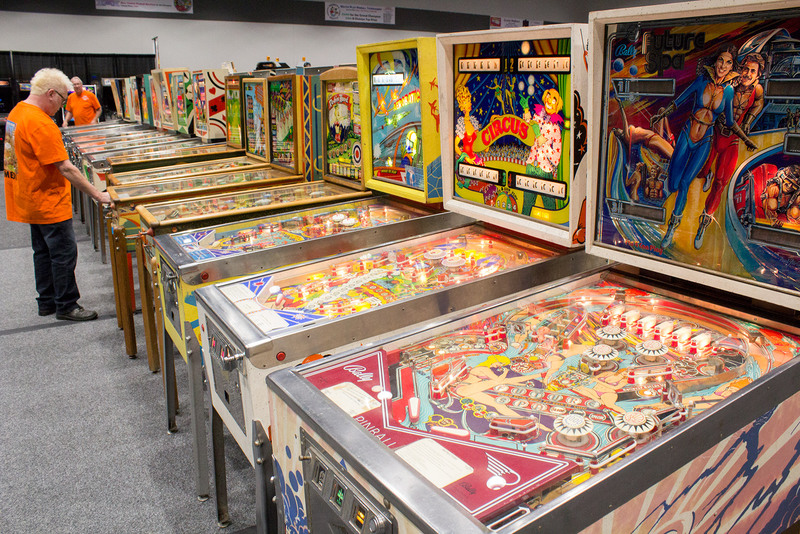 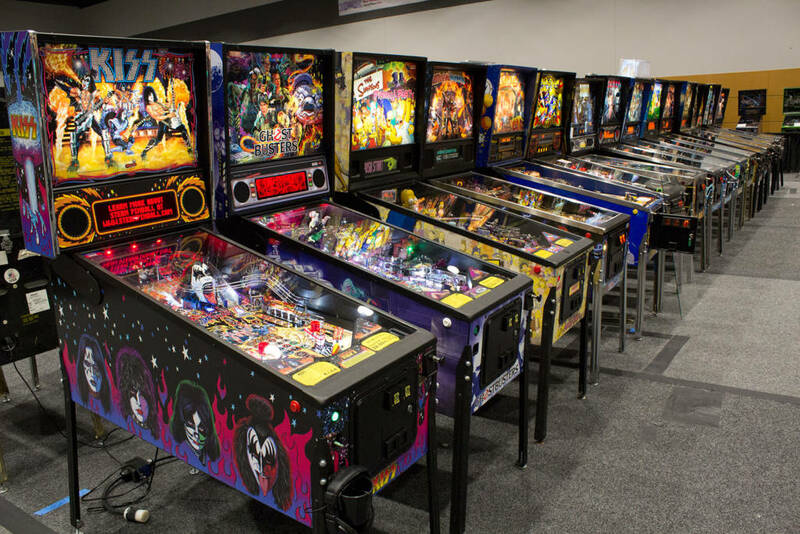 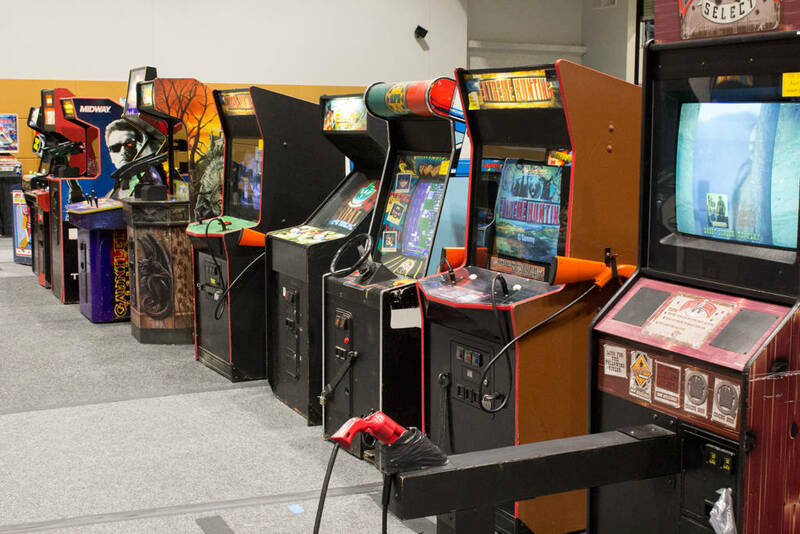 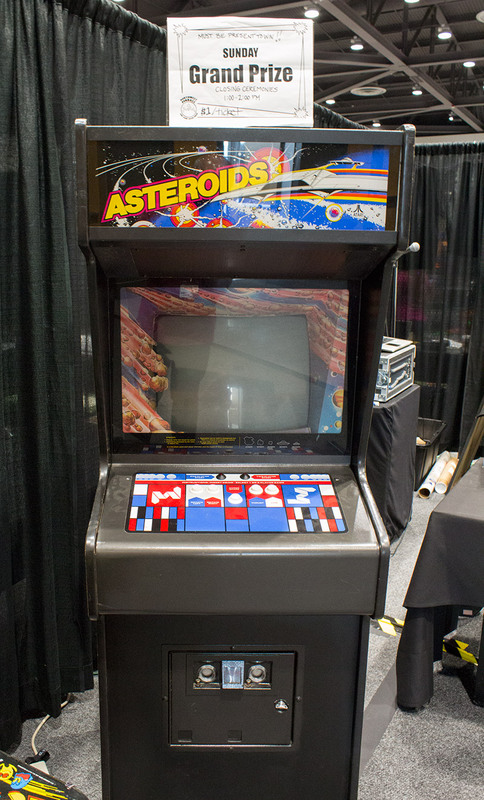 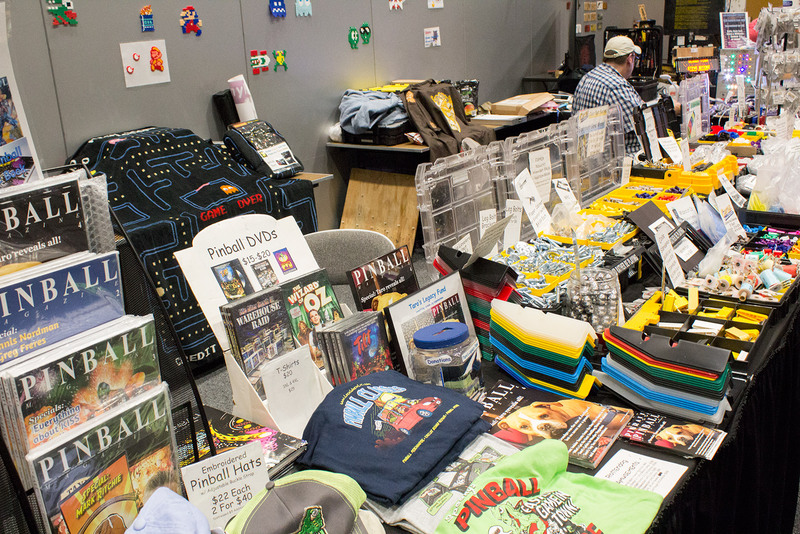 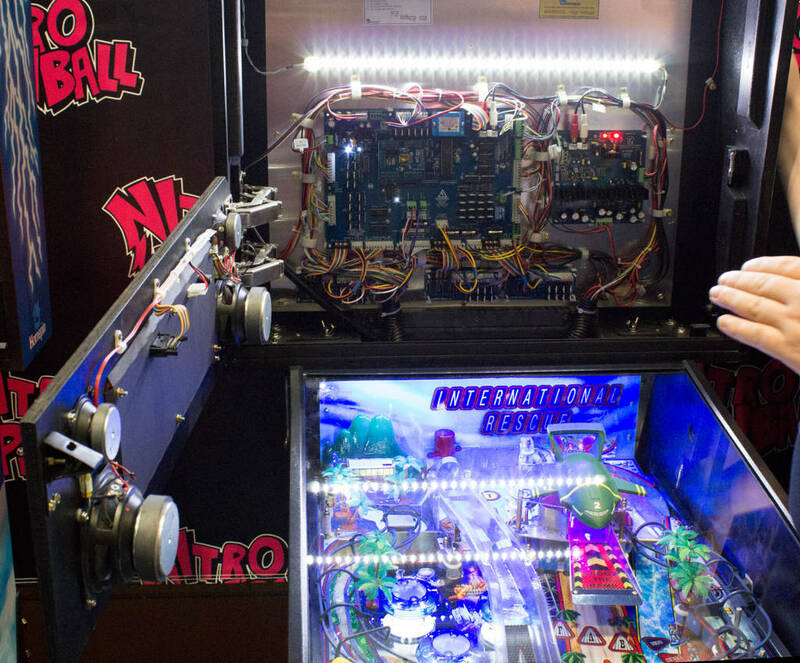 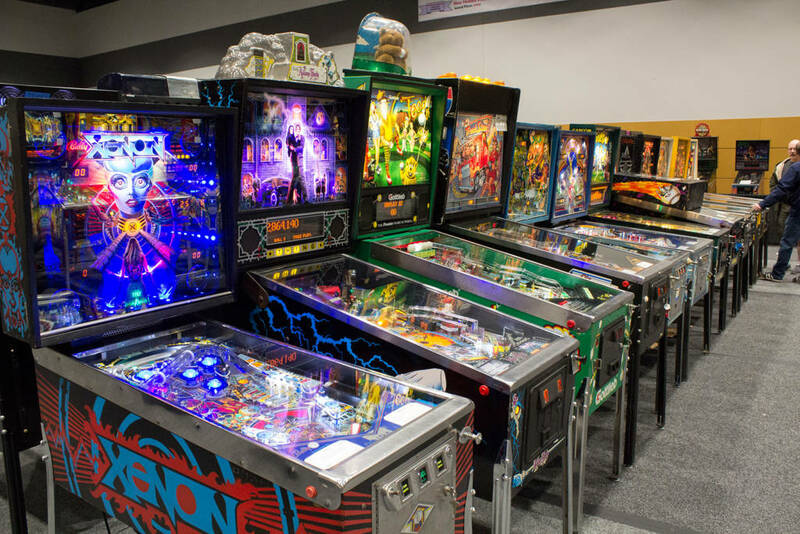 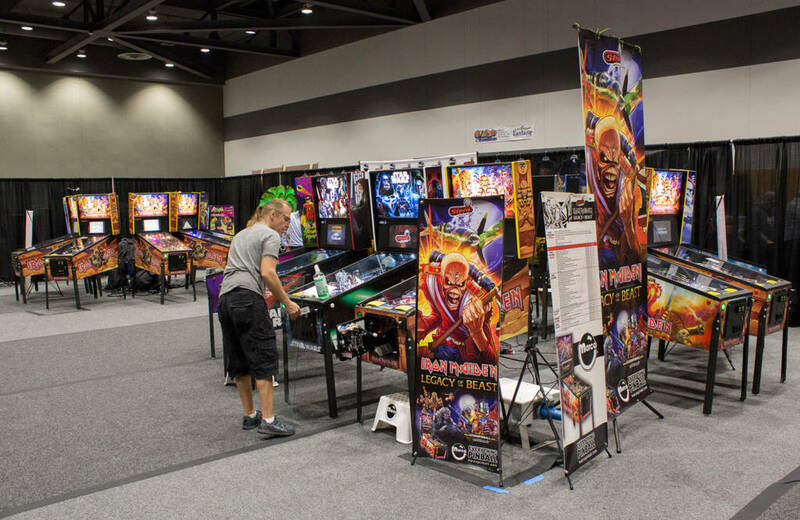 They need the additional capacity, Joe said, so that when they announce their second title – which they hope to reveal at Pinball Expo in Chicago this October – they will be able to start shipping it within a month or so. The final seminar for Friday featured two World Champion pinball players facing-off against each other in a series of challenges. 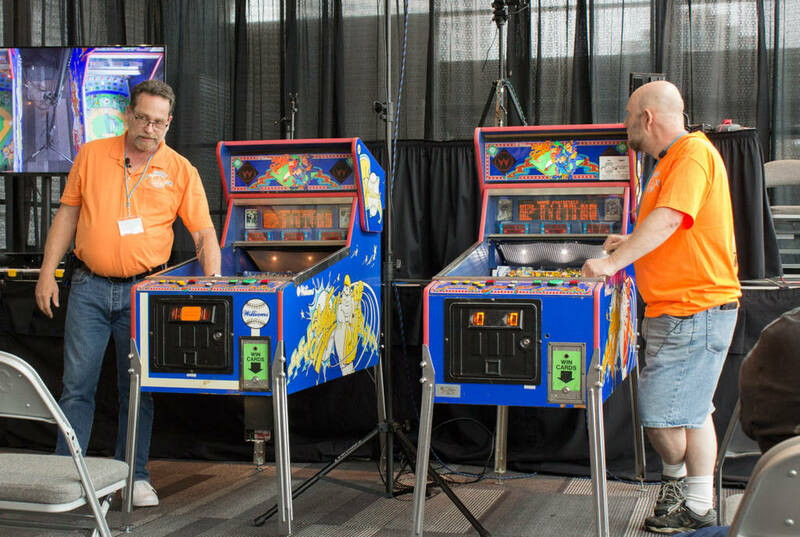 Raymond Davidson and Robert Gagno Raymond Davidson from the US and Robert Gagno from Canada were set a number of tests to see who would prevail and win the grand prize of $1. 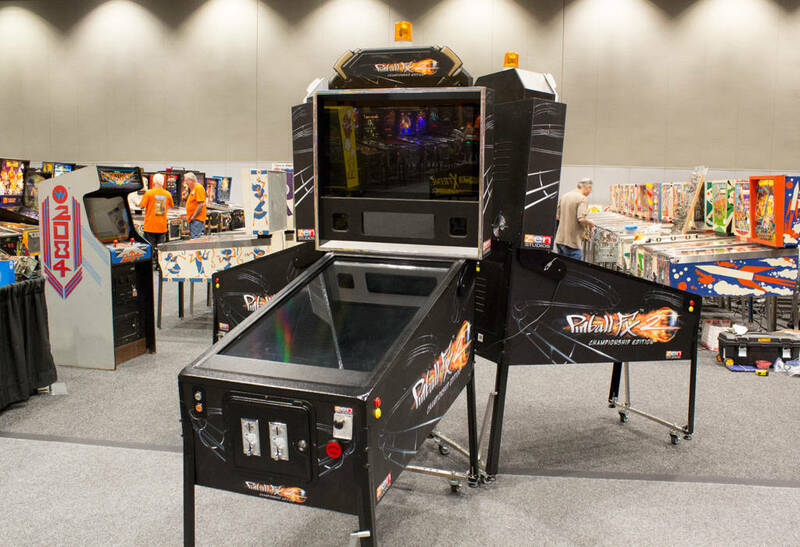 Challenges included completing as many ball control manoeuvres within a time limit and scoring as many points as possible while playing one-handed for two minutes, all while answering questions about their strategy and explaining why they were making particular shots. 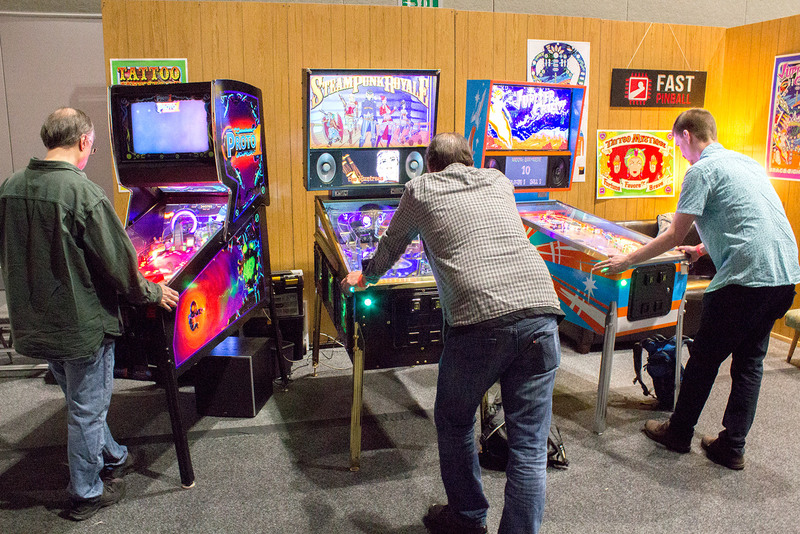 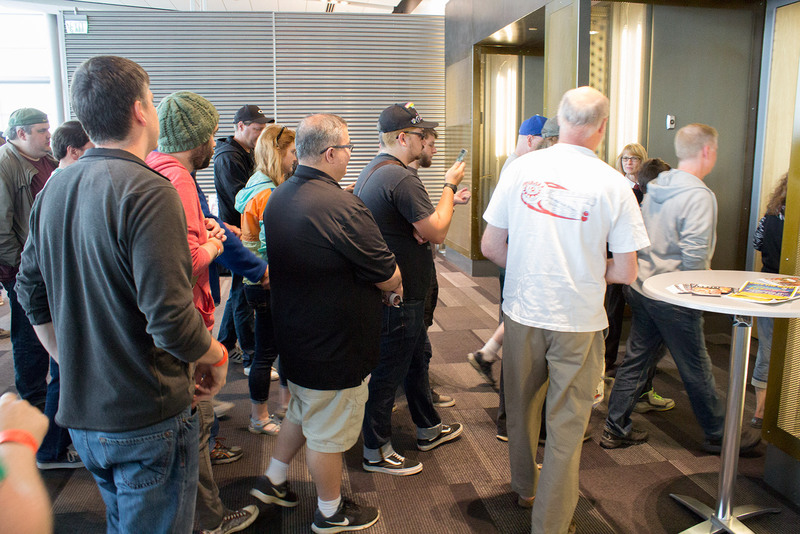 The session brought the largest audience of the day to see recent IFPA World Championship winner, Raymond, win the overall contest and claim the prize money. 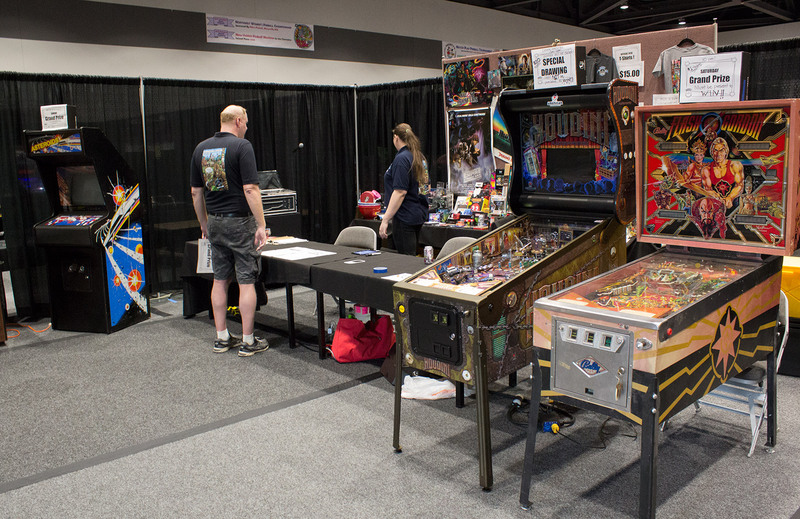 The audience for the 7pm battle of the Champions challenge That concludes our coverage of the opening day of the Northwest Pinball & Arcade Show, but you can check out all our reports at the main NWPAS page. 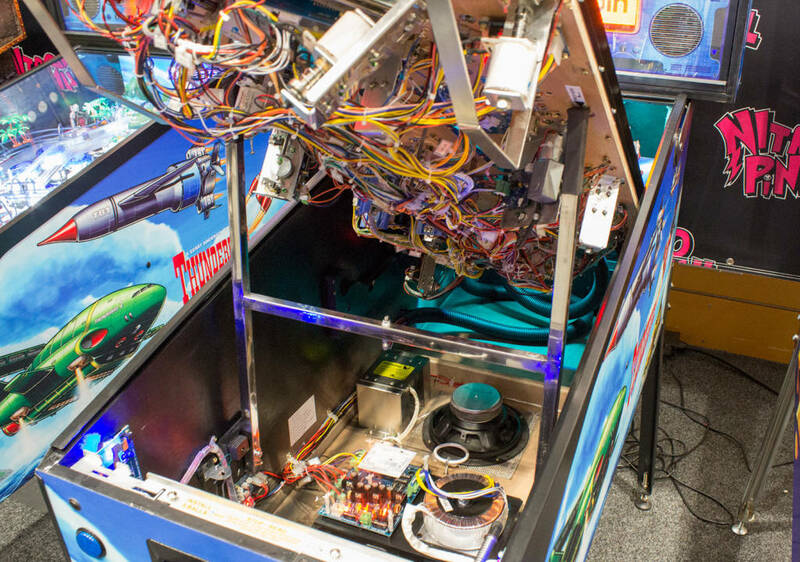 The Thunderbirds game was getting a lot of attention even before the show opened We had a sneak-peek inside Thunderbirds to see how it is put together. 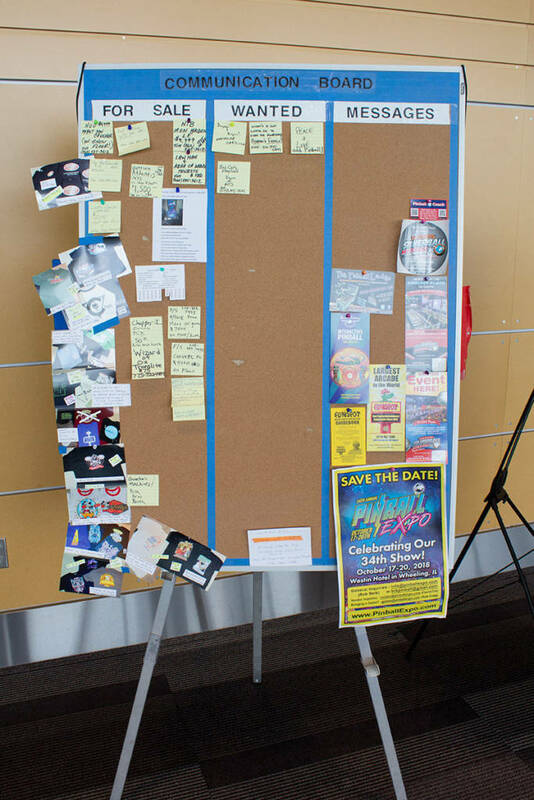 It’s worth noting that this is still only a prototype game so various elements may change before production.